Keighley News March 7th 1953. Nearly twenty years after the bandstand erected in memory of Edward Newton was opened, the playing fields association were in the process of organising events to celebrate the coronation of Queen Elizabeth the 2nd in 1953. In doing so they booked a brass band from Shipley to play in the bandstand, they also made a kindly request to the band to play some of Edward Newton’s music during their programme. 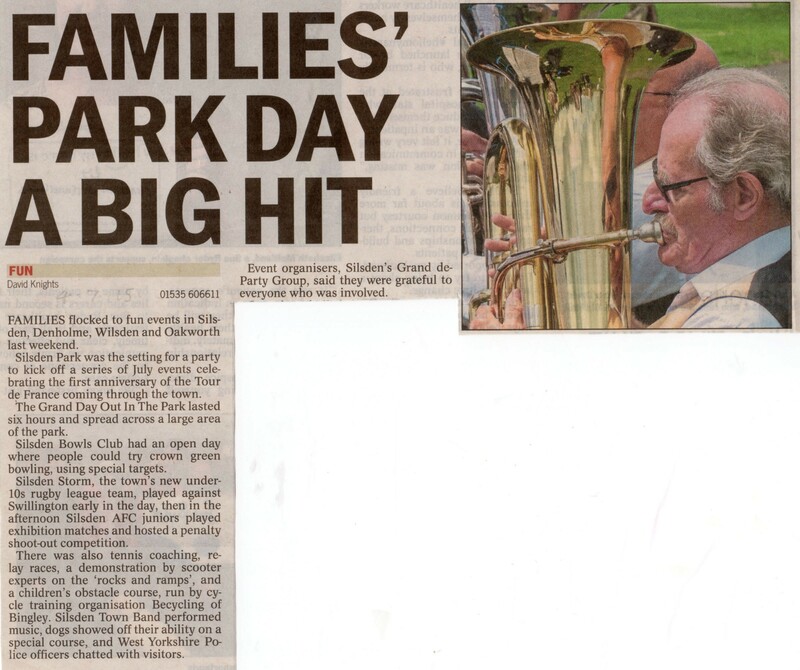 The playing fields committee recommended that a band concert should be given on the afternoon of Sunday June 14th, Butterfields Tank Works Band at an inclusive fee of £20. It was further resolved that in view of the fact that the bandstand was erected in memory of the late Mr Edward Newton the band be requested to include one or more of his works in their programme. On Sunday 14th June the Butterfields Tank Works Band arrived, the day was very wet and the band were unable to play in the bandstand and had to play in the school room at a local church. The programme included two of Edward Newton’s hymns in their programme. 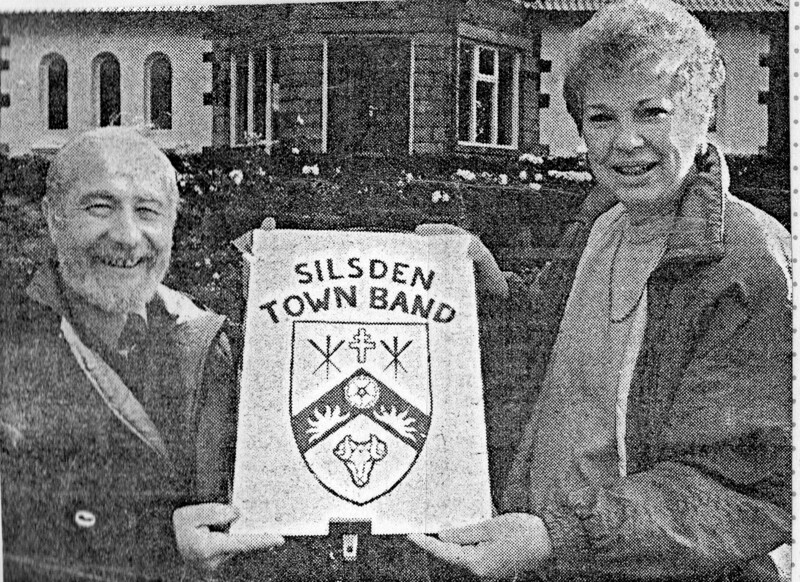 When Steeton and Silsden railway station was re-opened in May 1990 little did people realise that the event was to eventually spark the rebirth of Silsden Town Brass Band, after a period of fifty years since Silsden Brass Band last performed in the town. To celebrate the opening of the station many Silsdeners booked on an organised day trip to Morecambe and as part of the celebrations a band was hired from Cullingworth to play on the station platform and see them all off when the train departed. One of the local councillors Vera Wharvell thought at the time ‘wouldn’t it have been nicer for Silsden to have its own band, rather than hire a band from elsewhere for such occasions’. Kath Hardcastle who had organised the Morecambe rail trip heard of Vera’s musings and thought it was a good idea and handed Vera over a £100 surplus money from the trip, to organise a public meeting to see what interest there was in forming a band. The money could then go towards basic band needs such as music etc. At a meeting held in the Town Hall fifteen musicians of various ages and abilities volunteered their services. 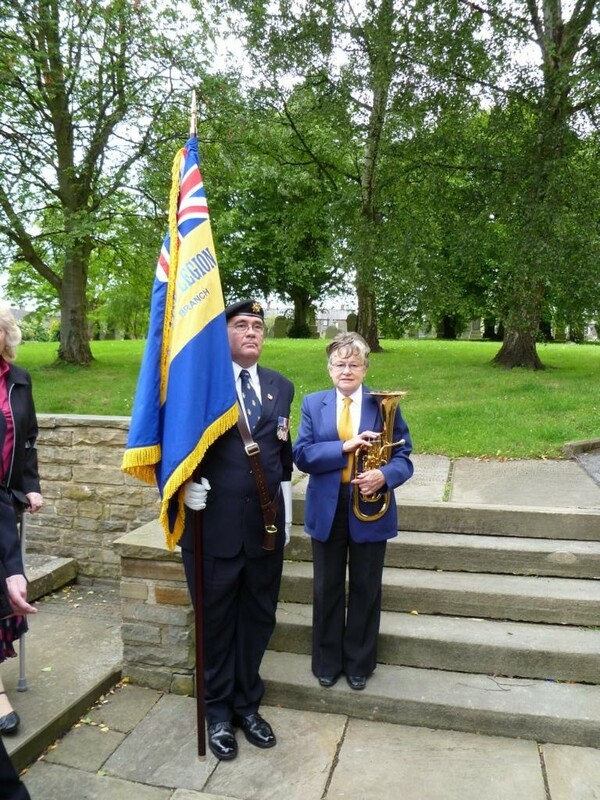 One of the players, John Knight, a saxophone player took on the role of Musical Director, John reckoned that the band could play well enough to take part in the local Silsden Remembrance Service at the War Memorial in a few months time. John also stated that it would not be a brass band but a military style band, this would enable a wider range of instruments to take part. He also wanted the band to be a marching band, which is not always an easy thing to perform well. John also saw the band as a civic amenity which would enable young people to develop a good sense of civic pride. Telegraph & Argus November 1990. 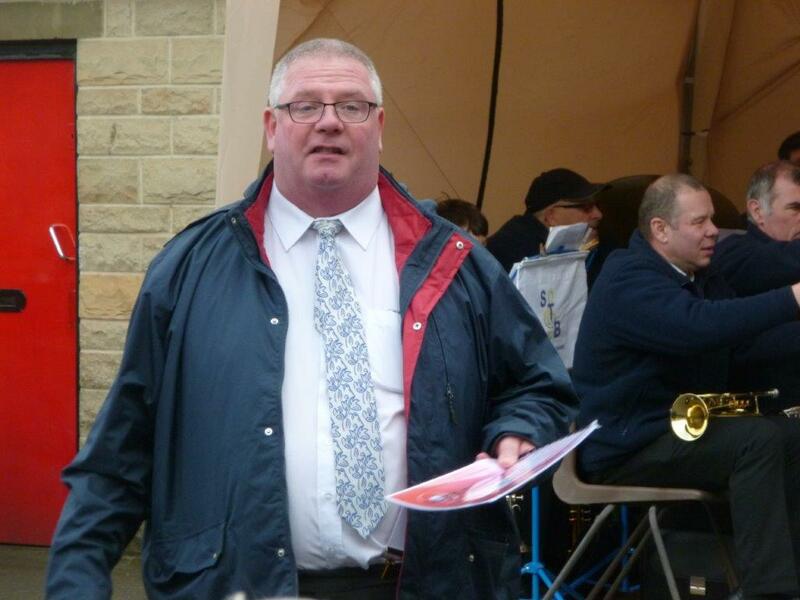 John Knight who has been Musical Director of the Silsden Town Band since it was re-formed in the summer after a fifty year break is stepping down and will be replaced by Derek Modley. The band Press Officer Kath Hardcastle said ‘music enthusiast Mr Knight has resigned due to other commitments’. Miss Hardcastle added ‘the band has got so many rehearsals for so many dates that have been booked that he feels he cannot give the time. We are sad to accept his resignation and want to thank him for the work he has done’. SILSDEN’S BAND FIRST PUBLIC ENGAGEMENT. 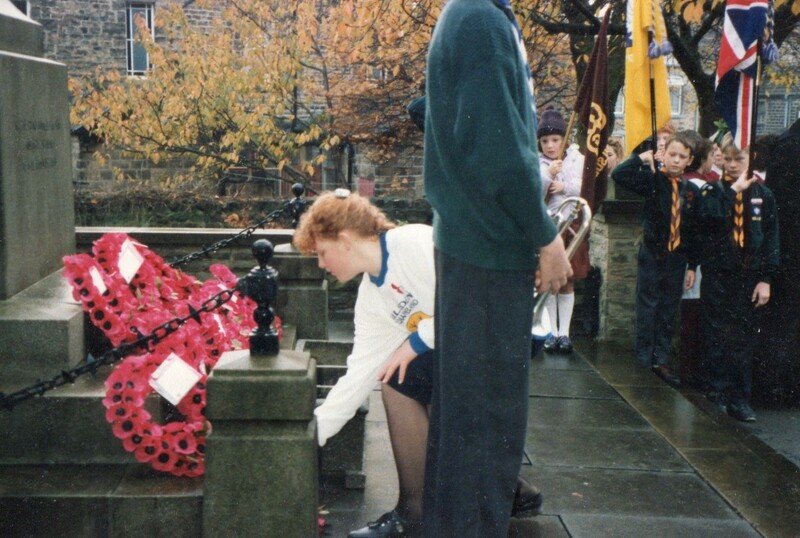 On Remembrance Sunday 1990 the fledgling Silsden Town Band made their debut by leading the parade to the cenotaph. Eight year old Rebecca Straker, the band’s youngest member, was the Mace Bearer. The twelve strong band, formed just three months earlier, led the ceremony in the singing of two hymns. A band member laying a wreath on behalf of Silsden Band during the service. Derek Modley who was already a member of the Silsden Band and on the committee took over the Musical Directorship from John Knight in November 1990. Mr Modley was also a Jazz player. Derek, a nephew of the former well known Yorkshire Comedian Albert Modley, had worked with Mr Knight in previous bands. Mr Modley could play a variety of instruments and had high hopes of the band raising enough money to purchase a Double Bass for him to play. 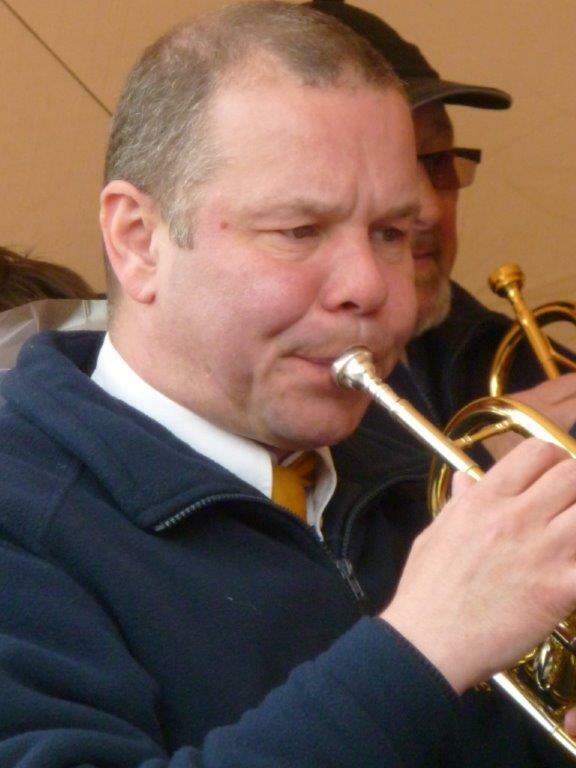 As well as being a proficient player of all Saxes, Keyboard, Reeds and Brass, Derek also arranged music. He was an engineer and worked at Seba Developments. 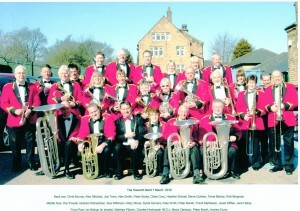 SILSDEN TOWN BAND WELCOME T.V. CELEBRITY. The band secretary called at Hollywood Bowl in Keighley to meet the Hollywood Bowl manager, David Woods to discuss a social night out for the band. He was invited to a further meeting with the manager who asked them if they could play the tune ‘HiDe Hi’ to welcome T V Personality Sue Pollard to the Hollywood Bowl on the following Saturday. If they could do this, the Tuesday Social Night for the band would be classed as a free night for them. Sue was to be at the event for two hours in the afternoon of Saturday in late November 1990, and he requested that the band learned to play ‘Hurray For Hollywood’ as this was to be the centres signature tune. As the timescale was short he requested that if they couldn’t learn it in time they would learn it for future occasions. 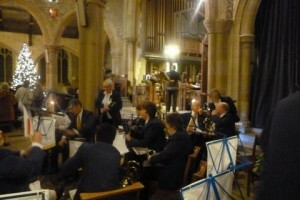 The band was also invited to play carols outside one evening nearer Christmas and take up a collection for the band. Majorettes Connection to Silsden Town Band. 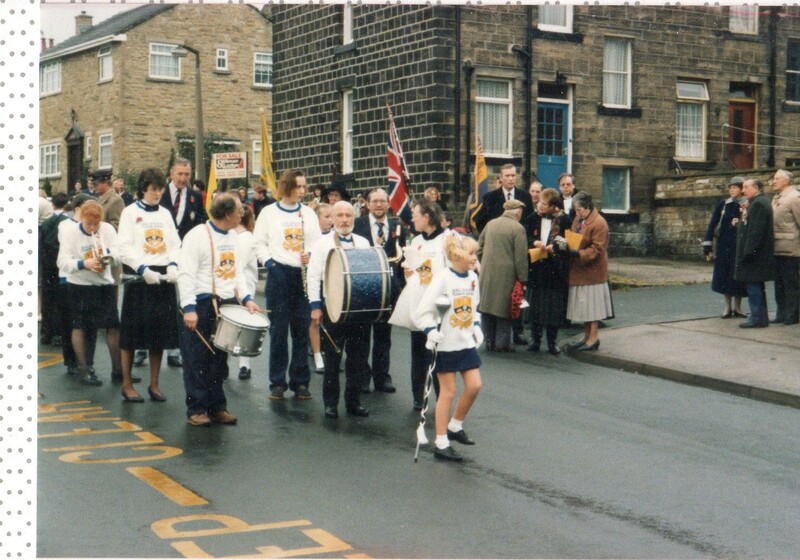 In the early days of the Silsden town Band, it had close connections with a newly formed troop of Majorettes who were being trained by expert Marjorie Cropper of Cleckheaton. The troops intention was to march and perform with the town’s new band at various functions. The uniform for the Majorettes was sweatshirt tops the same style as the band with the same insignia and motif (based on the town’s coat of arms) but the colour was blue, whereas the band’s tops were white. It would seem from these arrangements that Silsden Town Band was moving to an American style marching band with a Majorette troop in support. In the early days moneys acquired by the band and majorettes was deposited in a single bank account and the majorettes were also involved in attending band committee meetings. This arrangement eventually ceased when bank accounts had to be separated and the majorettes were not allowed to attend band committee meetings unless the agenda involved them in the band’s activities. 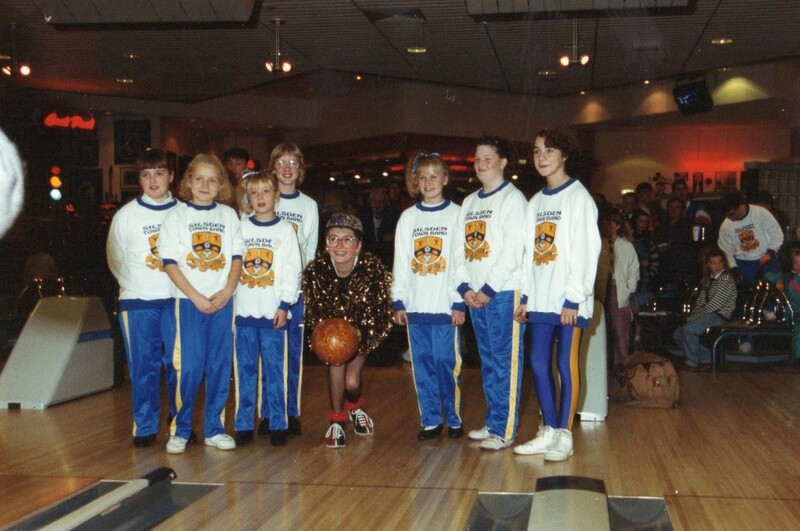 In April 1991 the band committee decided to make separate all links with the majorettes, although the relationship between the band and the majorettes were strained at times, they still continued to work together when performing at events such as the local carnival. 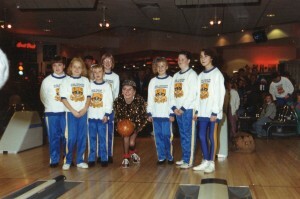 At a band committee meeting in August 1991 it was agreed that the majorettes would be invited to a particular meeting to discuss events for the coming month. Also at the committee meeting the Musical Director expressed his opposition to the majorettes playing ‘ghetto blasters’ on marches. He said ‘certain members of the public have approached him and did not like it’. The committee then agreed that if the majorettes wished to march with the band on future bookings then the band must make the decisions as to how it is done. Trip Organiser Kath Hardcastle arranged a day trip to Llandudno by special train from Steeton/Silsden Station. Members of the Silsden Town Band also travelled on this train and the band had been booked to perform at its first out of town engagement on the promenade of Llandudno. The band was accompanied by the majorettes. Raising Money For The Band. 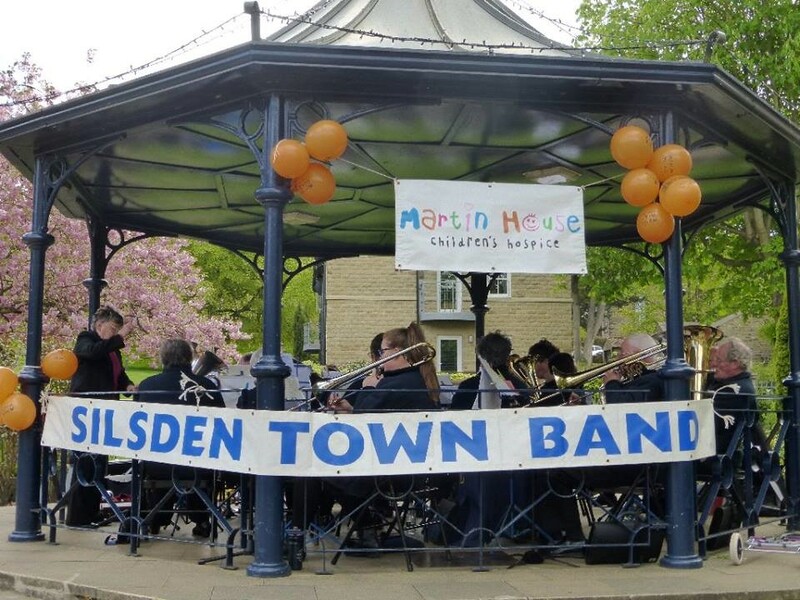 After the initial donation of £100 to help set up the Silsden Town Band it was realised that a large amount of money would be needed to sustain the band into the future. 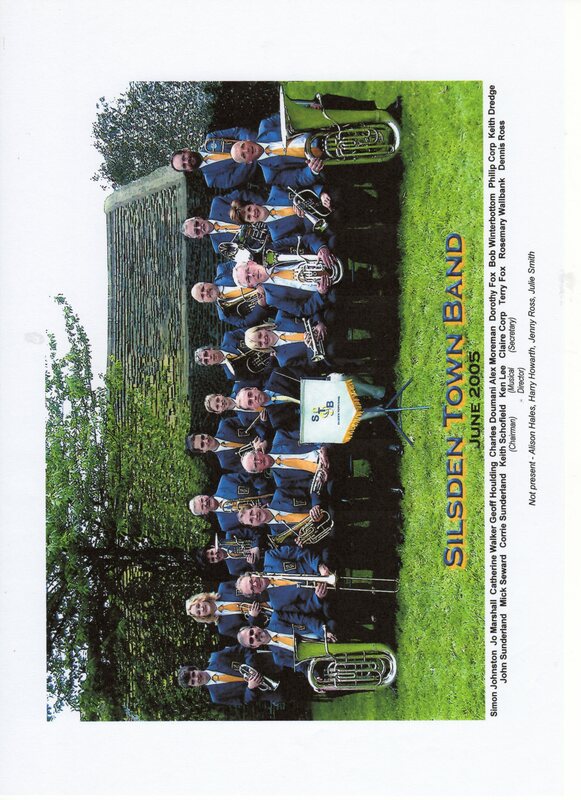 They had very few brass instruments and there was no trace of any of the brass instruments they could have used that may have been owned by the old Silsden Town Band. Thus the band re-formed with mainly reed instruments. The band committee soon set about organising a variety of fund raising events, these included coffee mornings and tombola, they approached business for donations and sponsorship, collecting boxes were placed in some of the local shops and over the years they applied to a variety of organisations for help. In 1992, Bradford Council donated a Flugel Horn. 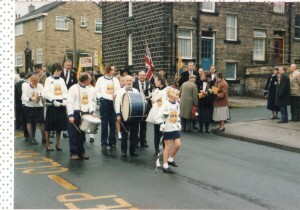 In 1996 they applied to the Keighley Area Panel and received a grant of £200 towards musical instruments and uniforms. 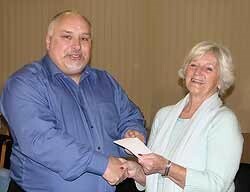 In 1999 a cheque for £600 was received from Bradford Council. 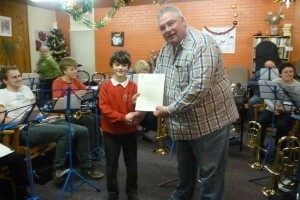 The band applied for a grant from the council for £1200 to pay for the purchase of band jackets. This was based on 20 jackets at £60 each. They were fortunate to get a grant of £600 so leaving the band to find the extra cost or find cheaper jackets. 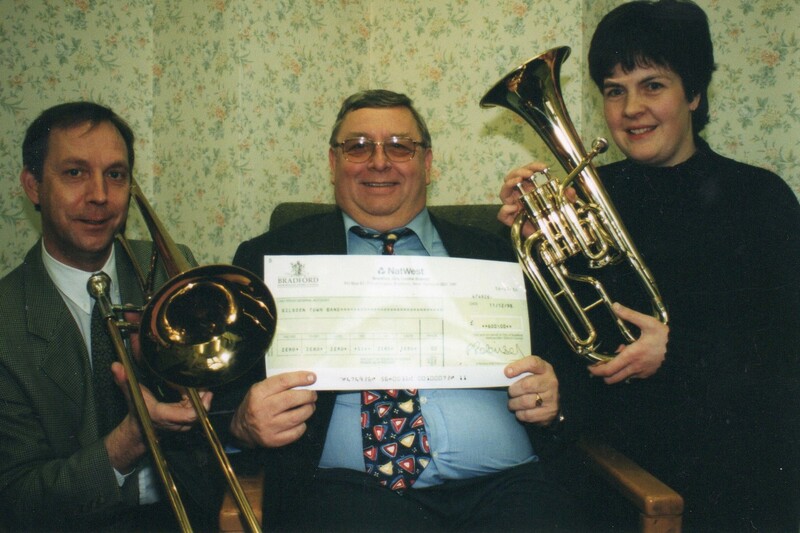 In 2002 the band received a grant of £250 from The Craven Trust to purchase a euphonium. 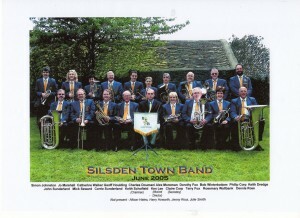 In 2008 after an appeal to Silsden Town Council the band received £600 to purchase fleece jackets to enable them to look more professional in winter. 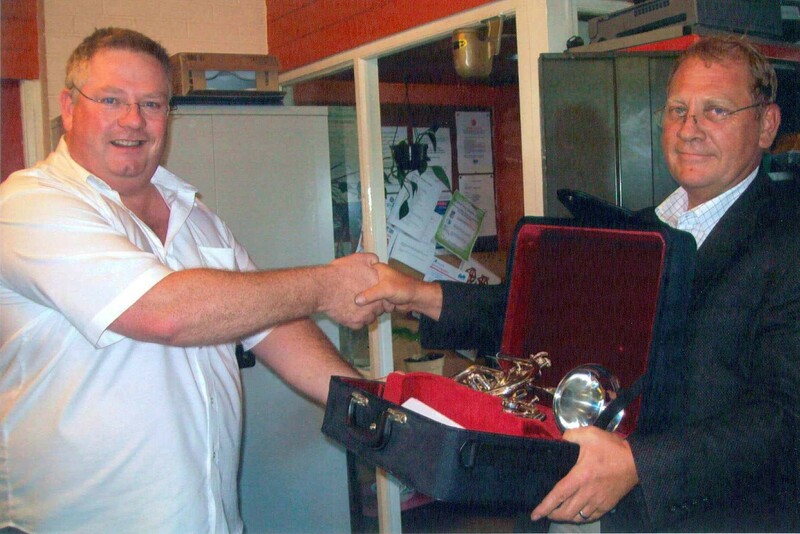 In 2011 Mr Etherington, a former Army bandsman, donated a Besson Cornet. 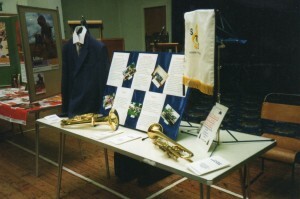 The band was asked by the Civic Society to take part in an exhibition for the Millenhium to reflect the activities of different organisations in Silsden, to be held at Silsden Methodist Church in late Autumn 1999. This was a good opportunity for the band to raise awareness of their existence in the town and its surrounding area, and hopefully recruit new members. Bands display at the Millenium Exhibition 1999. 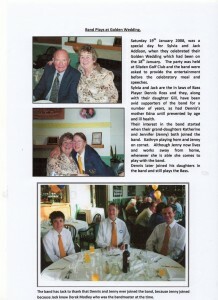 In 2006 in the First Issue of The Insider Community Magazine (Ilkley Edition), the band secretary Claire Corp wrote an article promoting the band and trying to recruit new members to join. In 2013 the band had an article printed in the Aire Valley Magazine which told a little of the history of the band up to the present day and also included the request for new members to join. The band regularly advertises in the local press telling people about the time and venue of practices and inviting interested parties to come along to practices. Jo’s interest in banding started because of her next door neighbours who used to hold band rehearsals in their front room. 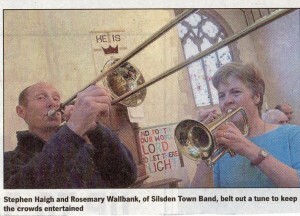 She played in Silsden Band prior to becoming the Musical Director. During Jo’s time with the band it was agreed that a ‘starter’ band should be formed in the hope that they could teach people to play brass instruments and thus eventually augment the band. Jo played an integral part In this in teaching people to play. 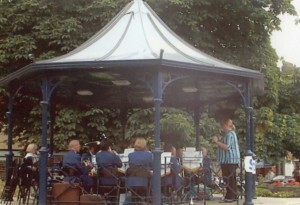 The band performing at Ilkley Band Stand on 5th July 2003, conducted by Jo. 2004, when Ken Lee took over in October. When the band re-formed in 1990 it did not have a permanent base of a band room in which to carry out its activities. In the early days the Town Hall was used for band practices and committee meetings, but the band appealed in the local press to find a suitable room to hold their practices with space for storing music and band equipment, but were not successful. As well as using the Town Hall committee meetings were often held at various venues such as The Playing Field Pavilion, private homes, Conservative club and at some other Silsden Social Clubs. The band practices were mainly based at the Town Hall but on occasions had to be held at other venues. 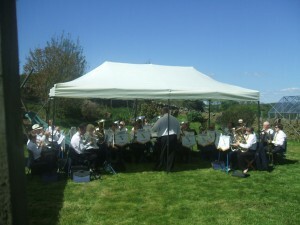 Eventually the band found a more permanent base at the Community Centre at Gloucester Avenue, but the storage of the band equipment is limited and if extra practices are needed the band have to make other arrangements. 2002 was the year that the country celebrated the Golden Jubilee of the Queen. 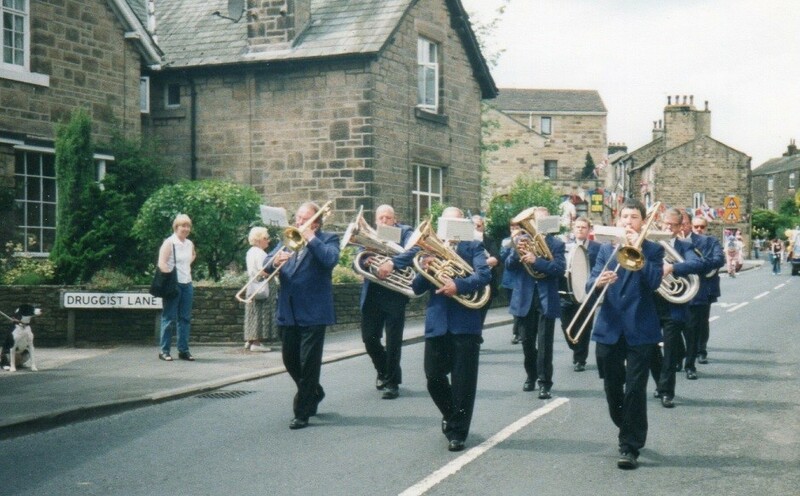 The band was booked to play at the Addingham Gala on 13th July and for some reason the band had to march in the procession, the current band not having marched before. 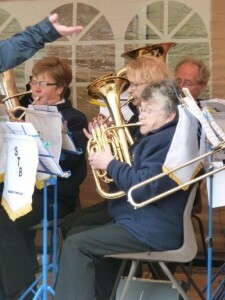 The band needed to have marching rehearsals for the event and it was hoped that Rosemary (Treasurer) who lived on a farm could provide the space needed for them to practice. For their first march in public the band played the marches ‘True and Trusty’ and ‘Slaidburn’ as it led the procession through the village. 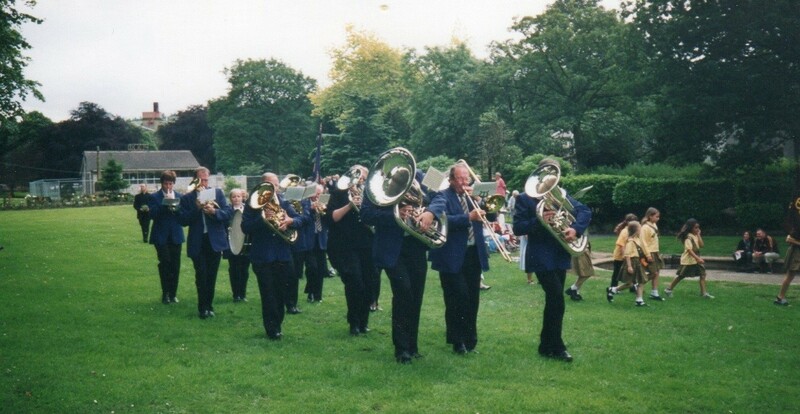 The band continued with the Jubilee Celebrations next day at Sutton Park where they were to provide the accompaniment for the hymn singing at the Cross Hills and District Fellowship of Churches. 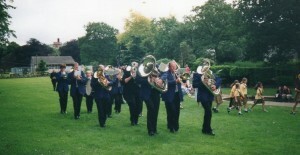 Prior to the singing, the band marched through the park to the point where they were to perform. The photographs indicate that the band’s marching skills were first class. In contrast to this in the early formative years of the band the marching ability was brought into question at the Annual General Meeting by a disgruntled bandsman. 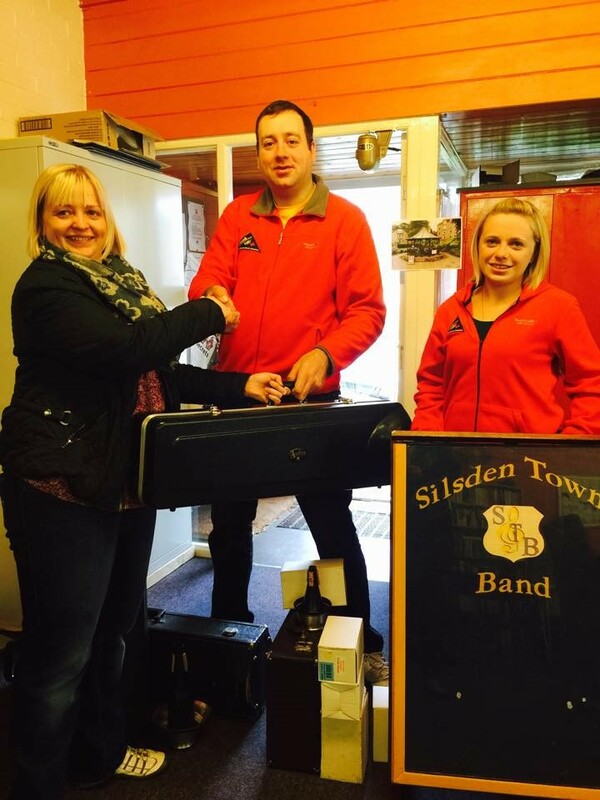 Silsden Town Band’s New Bandmaster. 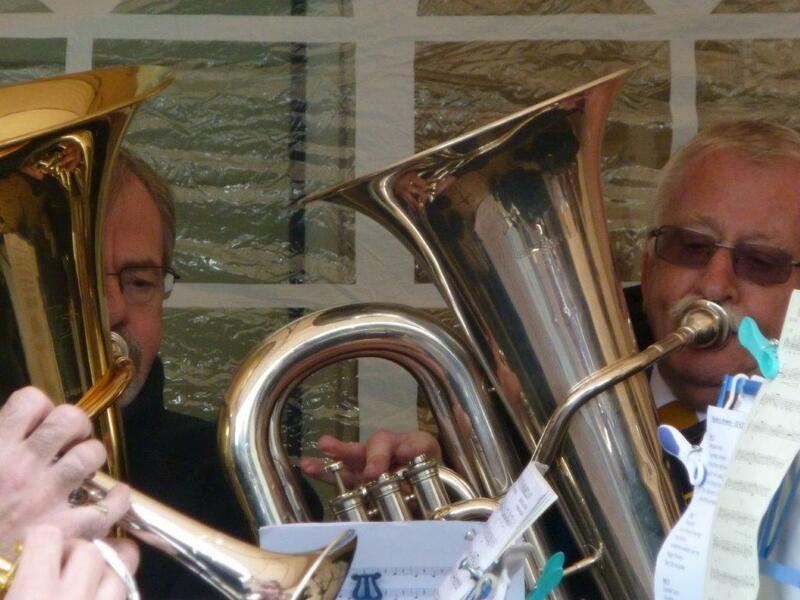 In October 2004 Mr Ken Lee NABBC (National Association of Brass Band Conductors) who was a free-lance brass teacher and conductor, who had had twenty seven years of service with Skipton Brass Band, had Musical Director at the band. Ken was no stranger to the band because he had been a guest conductor at times. Under his leadership the band grew in strength and ability and were able to take on a full programme of events. Ken was a good musician who wrote and arranged music. He was well known in the area for playing the trumpet at weddings. 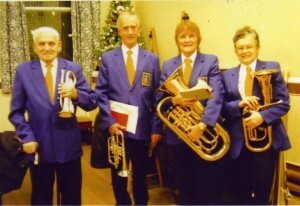 In January 2006 a family of four experienced musicians from a Salvation Army background joined the band. The head of the family Harold Clough had had over 60 years’ experience playing the cornet, his daughter Sylvia Somers a horn player with 55 years’ experience both in the Salvation Army and more recently with Haworth Band, his youngest daughter Mavis Clarkson a euphonium player with 50 years banding experience both in the Salvation Army and more recently with Haworth Band and his son in law a second cornet player. Initially Musical Director Ken Lee put Harold, aged 94, on second cornet but on hearing him play moved him to the front row cornet to help strengthen that section. Back row – Edgar Clarkson, Dennis Ross, Bob Winterbottom, Squire Firth (Guest Conductor) Phil Corp, Rosemary Wallbank. Middle row – Colin Holt, Rob Bergman, Malcolm Firth, Charles Doumani, Harry Haworth, Mavis Clarkson, Geoff Houlding. Front Row – Mick Seward, Keith Schofield, Jenny Ross, Claire Corp, Catherine Walker, Corrie Sunderland. After Ken Lee’s departure, once again the band found itself without a conductor. Mr Squire Firth helped out as the band played at the local Remembrance Service at Silsden in November 2008. 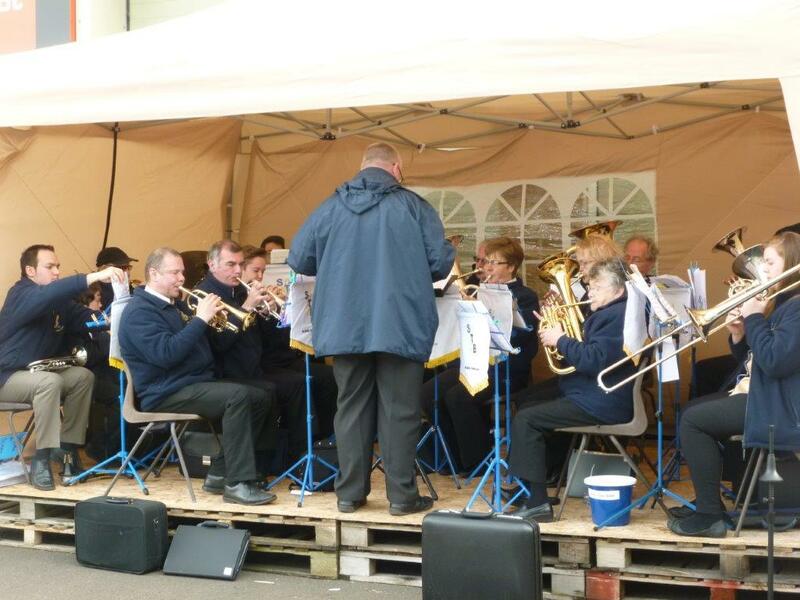 Over many years the band has supported numerous charities either by performing concerts for organisations or by making direct donations from its funds. 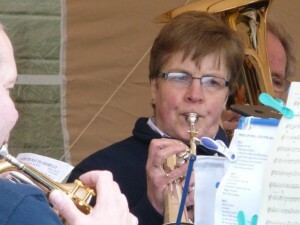 Band member Sylvia Somers took on responsibility for the band on a temporary basis and found herself in charge for about eighteen months until the new Musical Director Andrew Dunn was appointed in Autumn 2008. 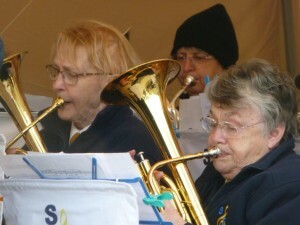 Sylvia, an experienced musician and brass band player passed exams as a Band Master in her late teens, when she took the examinations while a member of the Salvation Army. She continues to deputise when Andrew is on holiday. 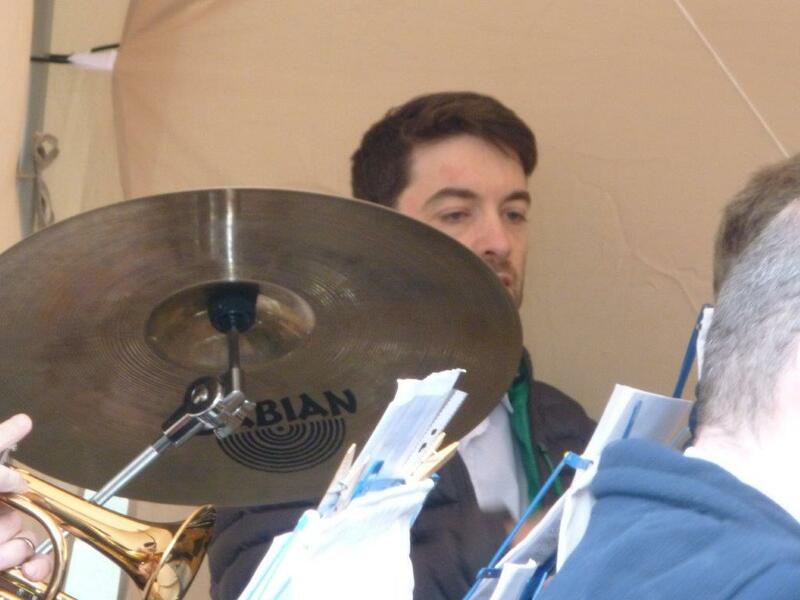 Musical Director – Andrew Dunn. Yet, in his early 20’s Andrew’s musical career took a different direction as he began first directing, and then writing musicals for production within his local church. This involved training large choirs of around 70 members, composing, arranging and scoring the music for the band, and giving performances at several churches, both locally and nationally. It was this pursuit that led in turn to Andrew’s involvement in modern worship-leading – something that became very important to him – and he has led and trained church-based worship groups for much of the last 20 years. 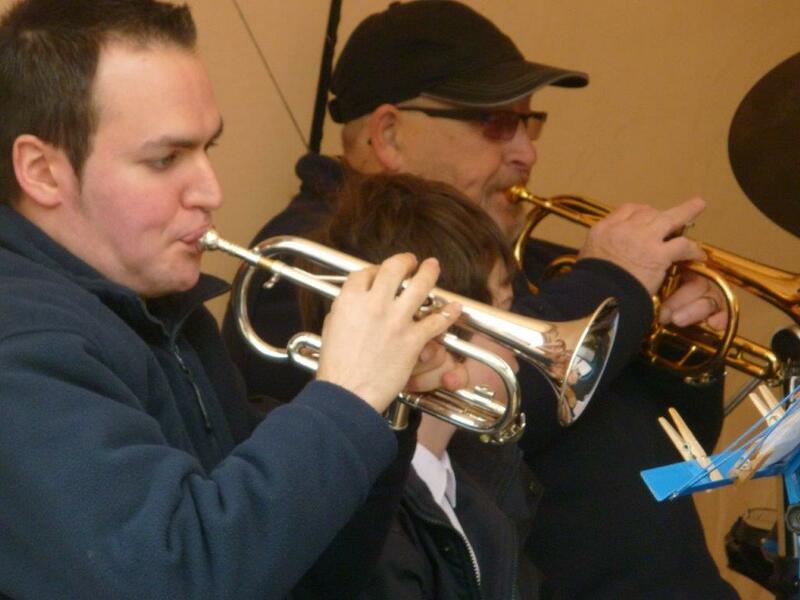 Andrew takes up the story: ‘And then one day I stumbled across the Silsden Town Band’s website and I noticed that they were looking for a Musical Director. I thought “Hmm, I think I’d enjoy doing that”, and finally, after a few months thinking about it, I made the call. The rest, as they say, is history! Silsden Town Band Members Guest With Haworth Band Spring 2010. Six members of Silsden Town Band joined with Haworth Band for the Yorkshire Brass Band Championships at St. George’s Hall on 7th March 2010. The band were contesting in the Fourth Section Bands. The six members were Chris Murray, Claire Corp, Heather Ebbrell, Rob Bergman, Andrew Dunn and Mavis Clarkson. 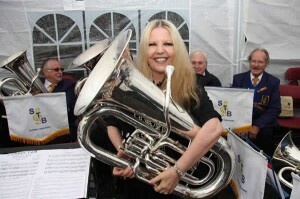 Sylvia Somers is a member of both bands. 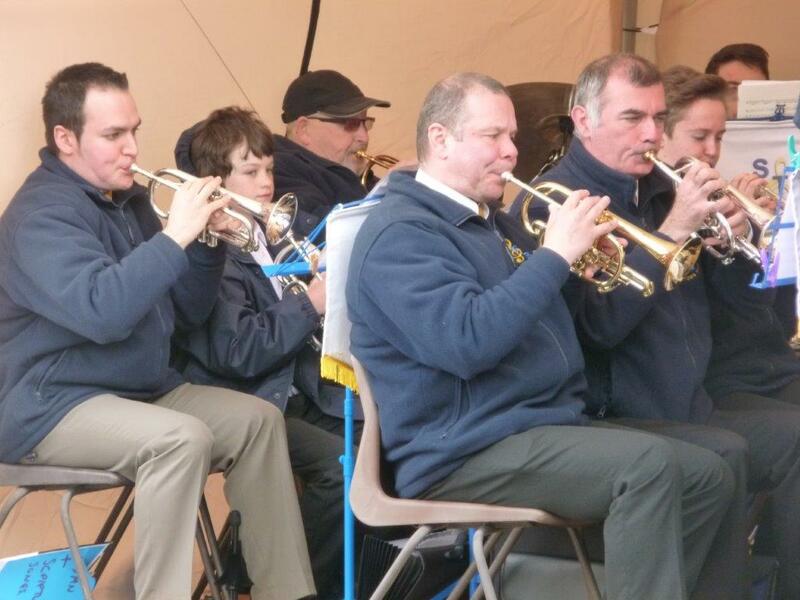 “Silsden Town Band is one of those brass bands that prefer not to go in for traditional band contests but instead, concentrate on supporting local community events. As such, they can be seen throughout the year at village galas, summer fairs, church services, Christmas extravaganzas and such like. 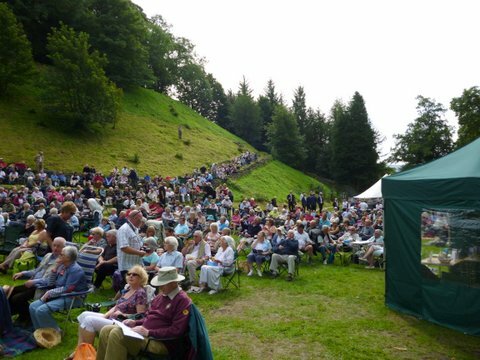 Last Saturday’s concert at Cross Hills was one such occasion. It was advertised as an ‘Evening of Popular Music’ but what it didn’t advertise was the sheer variety and quality of their band. In front of a packed house, they treated the audience not only to the band classics of marches like ‘Slaidburn’ and hymn tunes such as ‘Deep Harmony’ but also to big band sounds, selections from musicals, right up to (relatively) modern pieces like ‘Is this the Way to Amarillo’. Possibly the musical highlight was a brilliant rendition of ‘Buglers Holiday’ featuring three very talented cornet players, ably supported by the rest of the band. Further variety was added by a tuba quartet and a standard brass quartet. 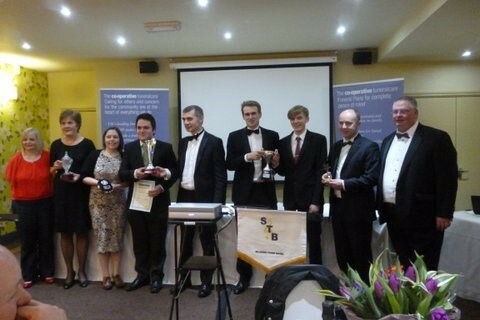 Musical Director, Andrew Dunn should be congratulated on achieving such a high concert performance from the band. Below is a picture of Sally Thomsett whom you may remember as one of the cast from the film “The Railway Children”. She also starred in “Man ab0ut the house” and other TV Sitcoms. 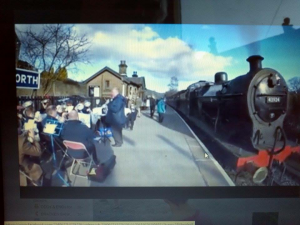 She revisited Oakworth Station where the original film of The Railway Children was set on the Worth Valley Railway. Silsden Town Band were invited to take part in the anniversary events and she is seen here posing with the band holding one of our Eb Basses. 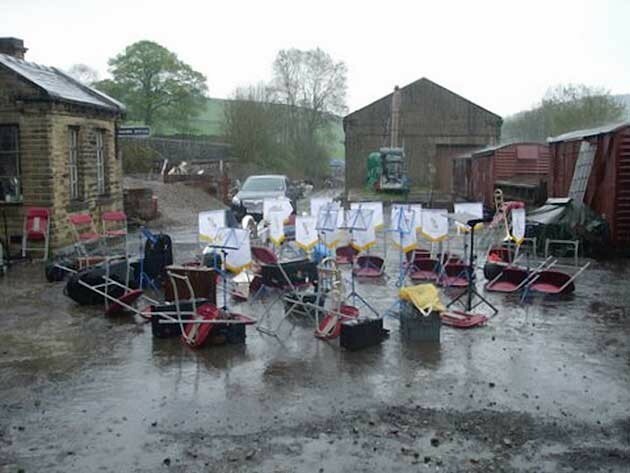 As indicated in the photograph (below) it was an extremely wet Saturday in May when the Silsden Town Band played for the Railway Children’s 40th Anniversary Celebrations. During the event when the train was due to arrive the band were asked to play a tune but to make sure that it was played wrong as in the film. To get this effect one or two of the members were given a different piece to play. As in the film, the Musical Director, Andrew Dunn, brought the band in to a cacophony of noise, the band were stopped and the tune commenced again – but the sound was no better. Eventually the Musical Director checked the music and changed some around so that when the band next struck up, the band were all playing the same music. Hopefully the onlookers thought that this was an improvement! Musical Directors Wedding October 2010. 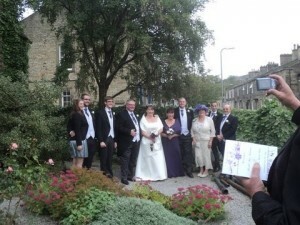 October 2nd 2010 was the day of the wedding of Andrew Dunn and Rachel Robinson. 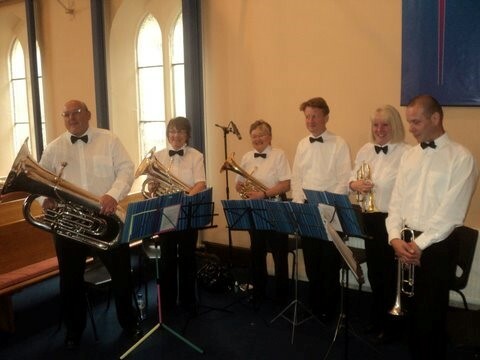 As Musical Director of Silsden Town Band Andrew had asked a group from the band to provide music for the service – Dennis Ross, Mavis Clarkson, Sylvia Somers, Chris Murray, Heather Ebbrell and Rob Bergman. They played before the service while people were entering Skipton Baptist church. The ‘Trumpet Tune’ by Henry Purcell was played for Rachel to walk down the aisle and the ‘Wedding March’ by Felix Mendelssohn for the Recessional. During the service they played for the singing ‘Lord of all Hopefulness’, ‘In Christ Alone’ and ‘Over all the Earth’. After the service they played tunes while the guests left the church. All members of the band were invited to the evening celebrations at Heriots. Dedication of Royal British Legion Flags. 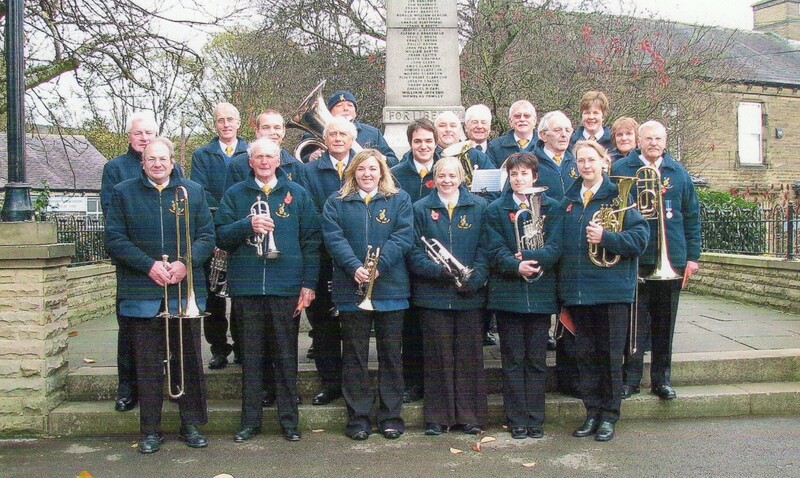 For many years Silsden Town Band has had close links with the Silsden Branch of the Royal British Legion. These links have been forged over the years with the band playing at the Remembrance Service in the town. Over recent years the Legion has had a greater input in the pieces played at the services as they are trying to get conformity throughout the country. The links were enhanced when the Royal British Legions new flags were dedicated in a service at St James Church, Silsden, on June 25th 2011, for during the service Sylvia Somers played the ‘Last Post’ and ‘Reveille’. Although traditionally these pieces are played on the cornet, none of the cornet players were able to help out on this occasion as the band were ask at rather short notice and Sylvia agreed to step in and help out by playing the pieces on the tenor horn. The playing of the pieces during the service was very moving for Sylvia was out of sight of the congregation, standing near the organist, and this proved to be very effective. July2nd and 3rd July 2011 was a glorious sunny weekend, one where the band had been booked to play at a wedding in Ilkley. On the Saturday, they played as the Bride and Groom arrived at the reception and played for a couple of hours while people were at the Champagne Reception in the garden before their meal. On the Sunday the band played again for a couple of hours while people once again attended a reception in the garden. The Groom was an American and so to make him and the American guests feel at home in Yorkshire, the band added one or two American tunes to their repertoire, including ‘Stars and Stripes For-ever’. Among the wedding guests was the well-known television celebrity Judith Chalmers who actually took the trouble to come and speak to the band and the actress Jane Seymour. 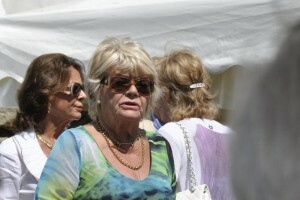 Judith Chalmers – Celebrity Guest at the wedding in Ilkley 3rd July 2011. 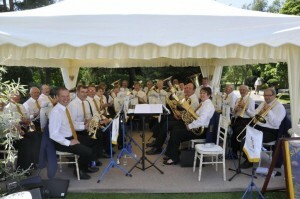 Silsden Town Band at the Wedding in Ilkley July 3rd 2011. Silsden Town Band were pleased to receive a beautiful Besson cornet from Mr John Arthington of Silsden. 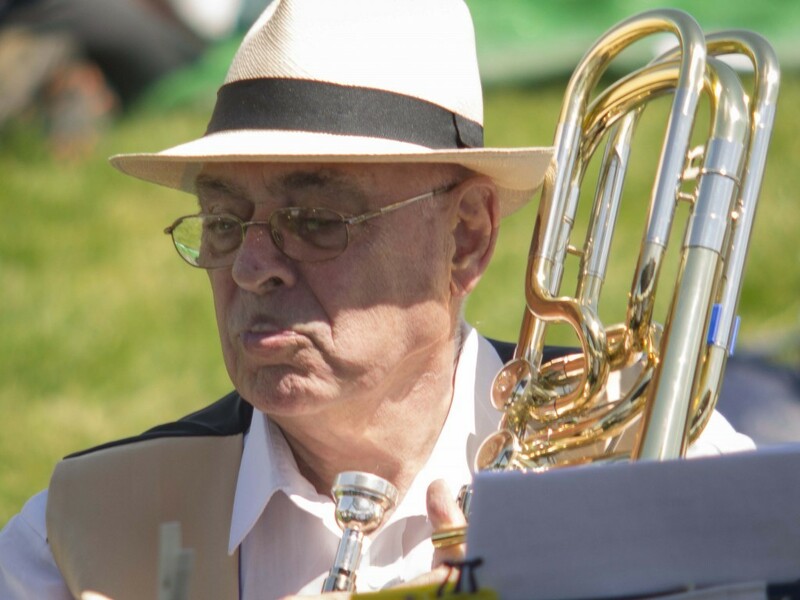 Mr Arthington, a former army bandsman and police officer, has now stopped playing and wanted the instrument to be used regularly to help other musicians. The band were delighted to receive this instrument and the cornet will certainly be put to very good use. 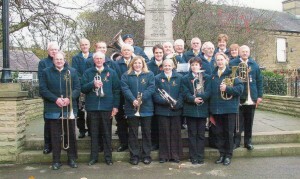 Co- Operative Funeral-Care approached Silsden Town Band in 2011 to discuss the possibility of sponsoring the band. After discussion to see what this entailed it was agreed that the parties would enter into an initial venture for a period of two years during which time the band would promote the work of Co-Operative Funeral-Care through the display of promotional banners where appropriate to do so. 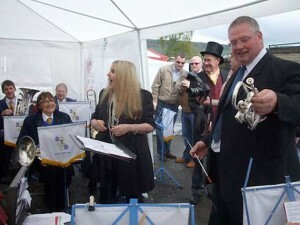 In addition, the band would play at two events nominated by Co- Operative Funeral-Care and organised and promoted by them. 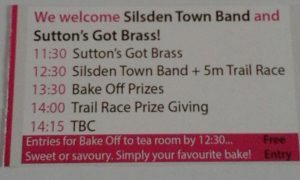 The sponsorship commenced during January 2013 and discussions are ongoing about the events however the band is to play at the Silsden Fun Run during September 2013 as one of the sponsored venues. 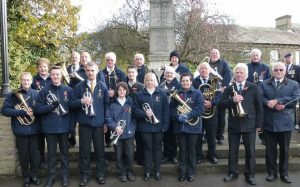 Although not part of the sponsorship agreement, the Silsden Branch of the Co- Operative Funeral-Care asked the band to play at Bradford Cathedral in December 2012 for a Service of Remembrance for people who had passed away during the year. 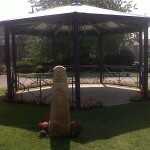 Silsden’s New Band Stand 2011. Hardraw Scar Brass Band Festival 2012. 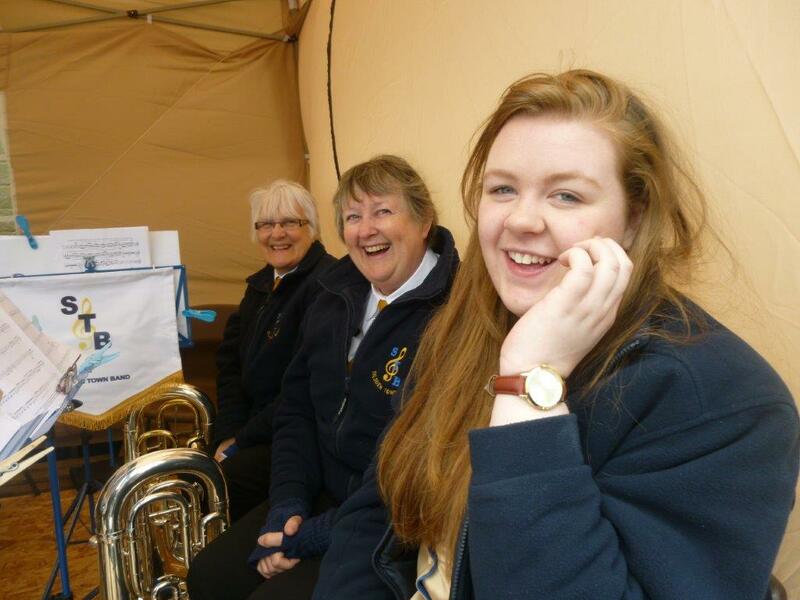 Silsden Band’s applicaton to take part in the 131stHardraw Scar Brass Band festival, near Hawes in North Yorkshire in September was successful. The festival was organised by the Yorkshire and Humberside Brass band Association. 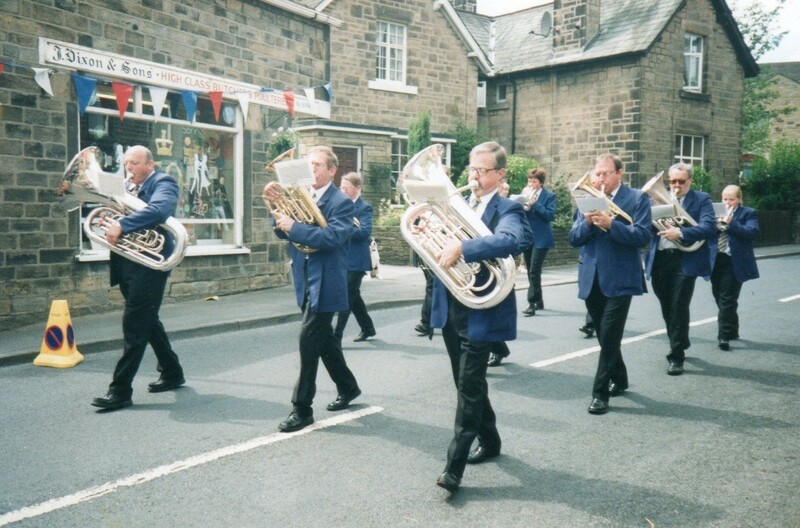 On the day of the festival the band had to make a very early start when leaving Silsden as they had been drawn to play first. After the long journey the band members had to register before performing on the band stand. The band opened the festivities with the National Anthem before performing its programme which included The RAF March, cornet solo Georgia played by Rob Bergman, the hymn tune arrangement Deep Harmony and The Best of Bond,which rounded off a good performance by all. The band was then able to relax for a while as twelve other bands performed throughout the rest of the day. The supporters of the band had prepared an enormous picnic for everyone to share which came out at lunch time. There seemed to be enough to feed the 1,000+ crowd, some people actually thought the food was for sale. At the end of the festival the band joined in the finale with the Massed Bands which played the marches Colonel Bogie and Punchinello. 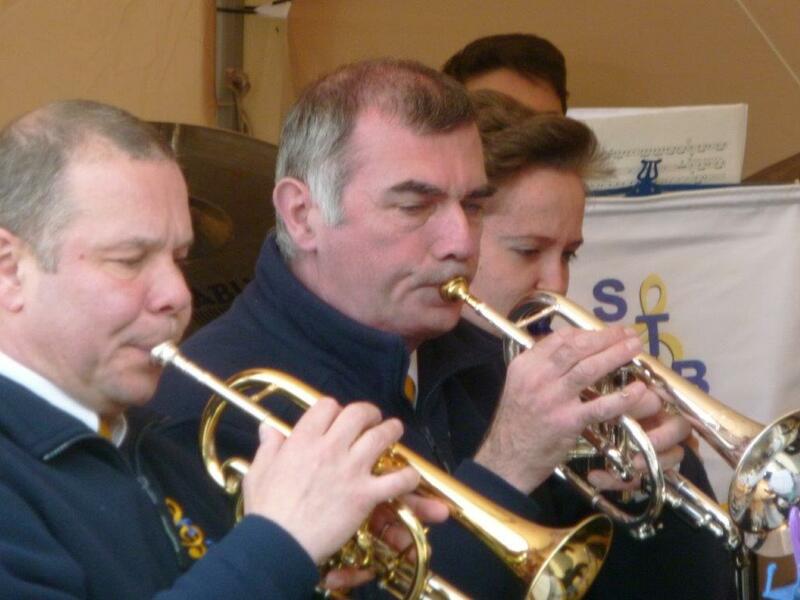 Although the band had not won any prizes they had acquitted themselves very well, Rob’s solo was brilliant. Naturally there was some disappointment but it had been a great day with great weather and a wonderful experience for all. Retired Bandsman 100 Not Out. In November 2012 on the 100th birthday of a former Silsden Band Member, the band were pleased to perform a surprise concert for Harold Clough at his Currergate Home. The concert which lasted an hour, in the cosiest venue they had ever performed in, included many of Harold’s favourite pieces. The band played ‘Fewster’ his favourite hymn tune and ‘Star Lake’ a march that he liked, the hymn tune arrangement ‘Deep Harmony’, among other arrangements. His two daughters, Sylvia Somers and Mavis Clarkson, members of the band played solos. Sylvia played the horn solo ‘I Close My Eyes’ and Mavis played ‘A New Direction’ on the euphonium. 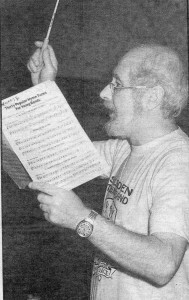 Andrew the Musical Director played tribute to Harold who had played in bands since being in his twenties until the age of 97, at which time he was the oldest bandsman in the United Kingdom. The concert was performed in front of many of Harold’s friends and family. The evening was a great success and was rounded off with a good buffet. Christmas Memorial Carol Service December 2012. 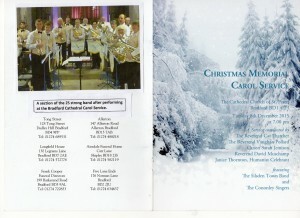 The band were asked to play at a Christmas Memorial Carol Service held in Bradford Cathedral which was organised by the Co-operative Funeral Care. 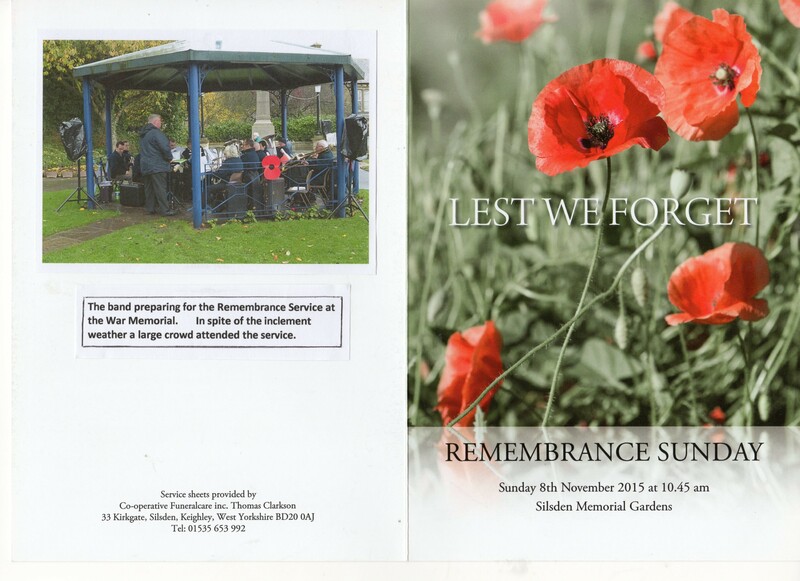 Although their sponsor Silsden Co-operative Funeral Care made the request, they were not actually involved in the service in any way, it was arranged by the Bradford section. The Cononley Singers were also taking part during the programme. 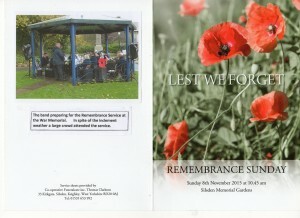 The service was to allow families and friends to remember loved ones who they had lost during the year. Members of all religious denominations were involved in the service. Carols were sung throughout the service and the band played for the singing of ‘O Little Town of Bethlehem’.During the service they played a Christmas Selection. Despite the sad occasion this was an enjoyable event, the acoustics were great, making for a good sound, the Cathedral was warm and there was a large congregation. Everybody was made to feel very welcome and we all enjoyed the refreshments at the end of the service. AWARDS PRESENTATION RESULTS FOR 2012. The Harold Clough award for dedication and long service was presented to Corrie Sunderland by Harold’s eldest daughter Sylvia Somers. The Player’s player of the Year was a tie between Phil Corp and Chris Murray. The Chairman’s Cup for Young Player of the Year was presented to Matthew Loud by Mary Binns. Young Band Members Celebrate Success in Musical Examinatons. 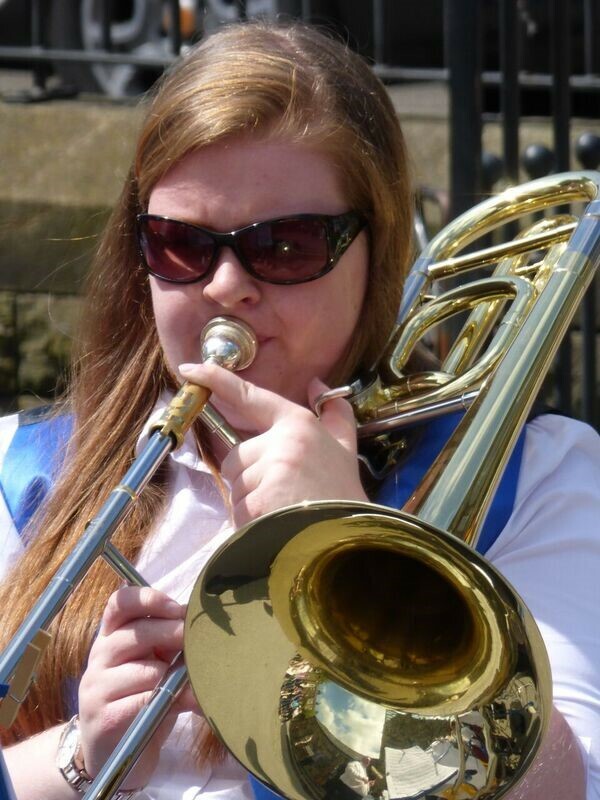 2013 has proved a successful year for some or our youngest band members who have been taking musical examinations. On Tuesday 16th April 2013 Andrew presented Kelvin Riley and Sam Shaw with certificates for their achievements in their musical examinations. 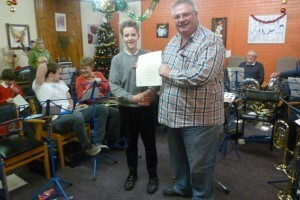 Kelvin receiving his certificate from Musical Director Andrew Dunn on the success of his Kelvin who plays the 2nd cornet in the band had passed the 4th Grade Practical Music examination. 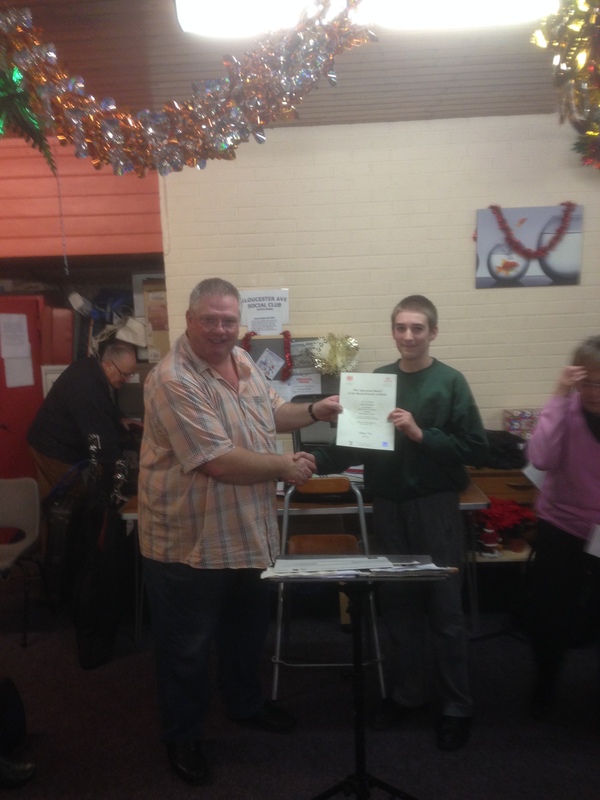 Sam who plays 3rd cornet in the band receiving his certificate from Andrew Dunn on passing his musical practical examination Grade 2. 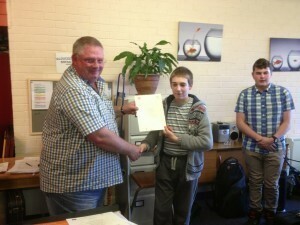 Sam gained a pass with merit in April. 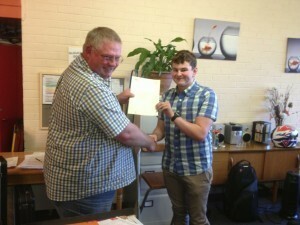 In July Sam passed his musical practical examination Grade 3. When members of Silsden Town Band arrived at University Academy Keighley on Friday 6th January 2012 they were pleased to know that the Junk Band did not refer to them or their playing. 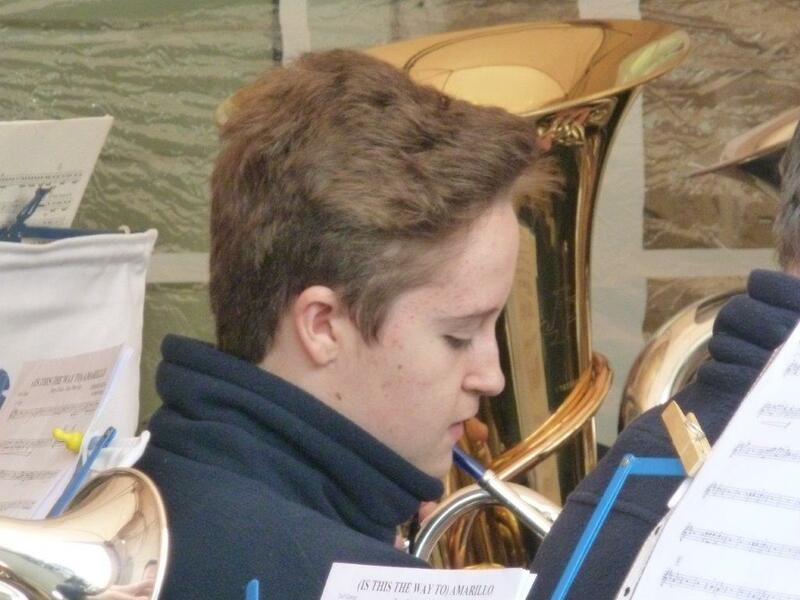 Julie Smith, teacher at the Academy and Euphonium player in the Silsden Band, had arranged for her son in law to bring the Junk Band from his school in Dover. Some of the teachers at the academy were concerned about the lack of interest shown by pupils in taking part in any form of music and hoped that the visit would improve awareness of how people can create music. The pupils in the Junk band performed by using wheelie bins, supermarket trolleys and other metal ‘instruments’. The effect was to make music using rhythm as in drumming. The conductor used the usual method of keeping time with his arm and hand movements, but so that he could be heard above the banging he also used the unconventional method of blowing a whistle. The Junk Band had performed for pupils during the day and also encouraged pupils to join in and learn how to play. A few of these learners actually joined the Junk Band for an item during the concert. 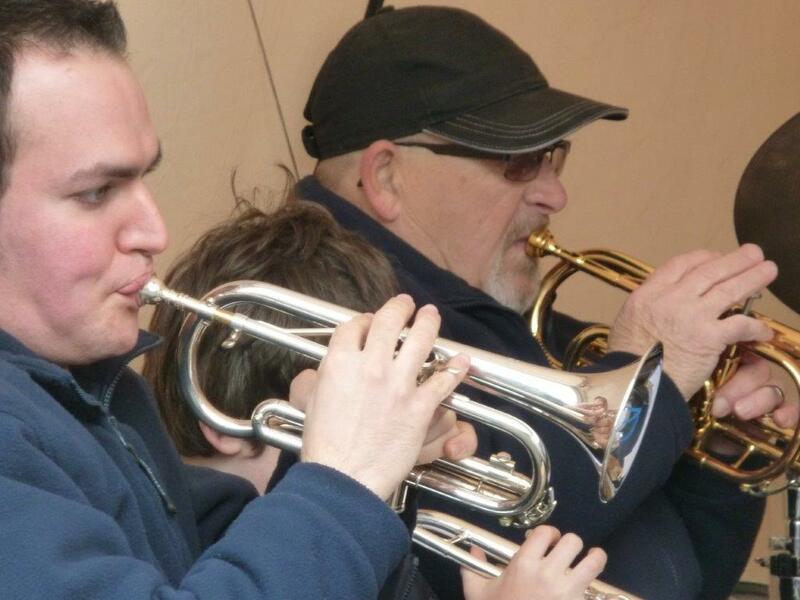 Silsden Town Band were asked to take part during the evening concert so that conventional type of music was also promoted in the hope that children might be interested to learn instruments so that the school might once again be able to form a brass band. Everyone had a thoroughly good time and enjoyed the superb buffet provided by Mary. Friends of Michael and Mary, Fiona and Ian Bishop played with the band. 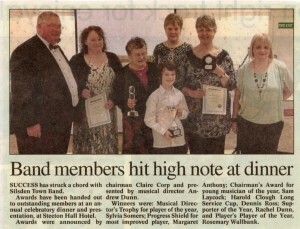 Both have been members of various bands and Fiona was the MD at Haworth at one time. Ilkley Bandstand 27th July 2013. A great turnout from both the band and the public to the Martins House Children’s Hospice held at Ilkley Bandstand on Saturday 27th July 2013 in exceptionally nice conditions. The bands contribution to the day was a 2 hour play from 10 – 12 where we played a range of music from famous show pieces to well known marches and was greatly appreciated by both the spectators and general public as well as all the volunteers who were there to run the event and collect the donations. 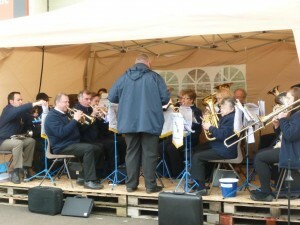 A total of £185 was collected during the morning while the band played. The following list gives details of the costs of various things that the hospice requires and provides an insight into what the money collected will provide. Silsden Town Band Annual Awards Evening 2014. On Tuesday last members of the Silsden Town Band held their Annual Dinner at Herriot’s Hotel Skipton. As well as band members, family and friends, honoured guests representing the band’s sponsor Co-operative Funeral Care were Lora Waterhouse and Barbara Hetherington. Prior to the dinner guests were entertained by the saxophone ensemble Saxuality. A display of pictures from the archives was organised by Tom Dunn. The after dinner speaker was former Band Chairman and present Band Librarian Mr Michael Binns, who spoke of the experiences and memories of the world of brass banding relating to him and his wife, band member Mary. The Supporter of the year award was presented to David Loud; the Harold Clough award for Long Service was awarded to Rosemary Wallbank; Players Player of the year went to Stephen Haigh; the Chairman’s Cup for Young Player of the year went jointly to James Loud and Robin Severs. Marie O’Horo received the Progress Shield; the award for Player of the year selected by the Musical Director went jointly to Charles Doumani and Richard Gosling. Picture shows from left to right – Chairman Claire Corp, Rosemary Wallbank, Marie O,Horo, Charles Doumani, Richard Gosling, Robin Severs, James Loud, David Loud and Musical Director Andrew Dunn. 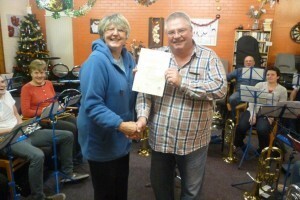 The Sponsors, Sylvia Somers and Michael Binns were presented with gifts for the work they have done for the band. Members of the Silsden Town Band performed a successful Spring Concert at St Peters Methodist Church in Cross Hills last Saturday. 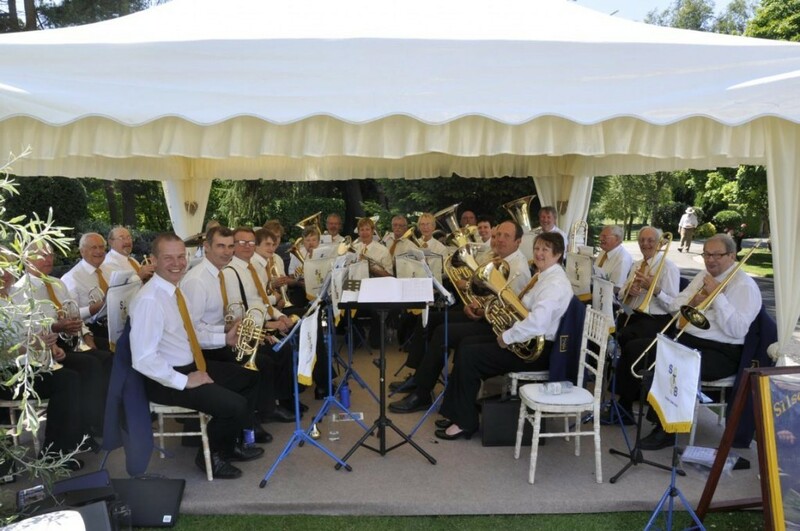 The 25 members of the band, who are sponsored by the Silsden Cooperative Funeral Care, looked smart in their new uniforms which consisted of royal blue waistcoats (which are reversible to gold), black bow ties or gold scarves, black trousers and white shirts. 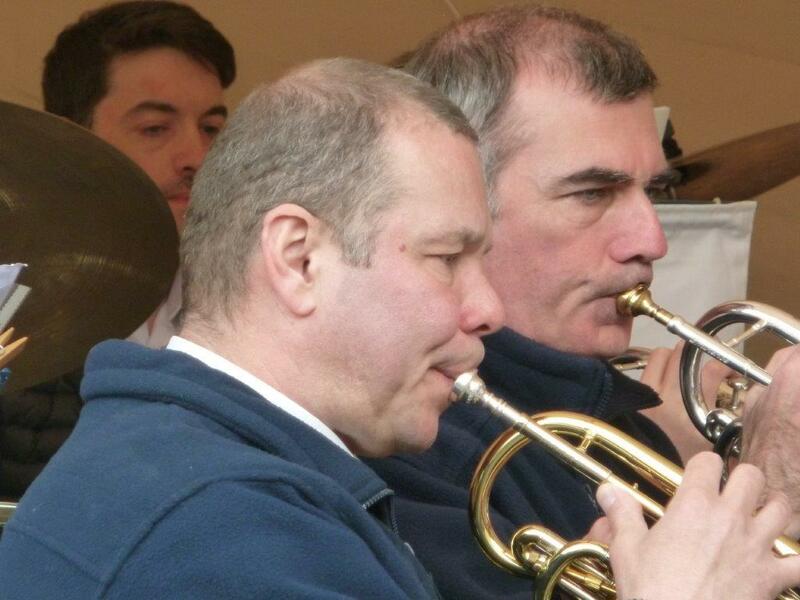 Under the conductorship of Musical Director Andrew Dunn a wide selection of music was played, this included traditional brass band marches, hymns and classical works, through to jazz, soul, big band and modern pop items. 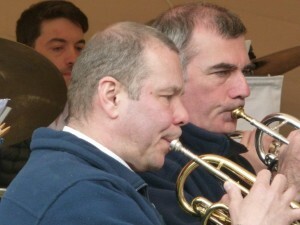 Solos were performed by Principal Cornet Player Robert Bergman on Trumpet and Sylvia Somers on Solo Horn. 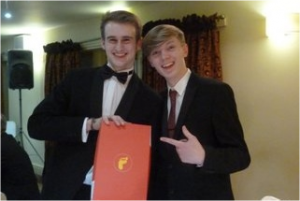 A total of £225 was raised for the band fund. Addingham Gala 12th July 2014. 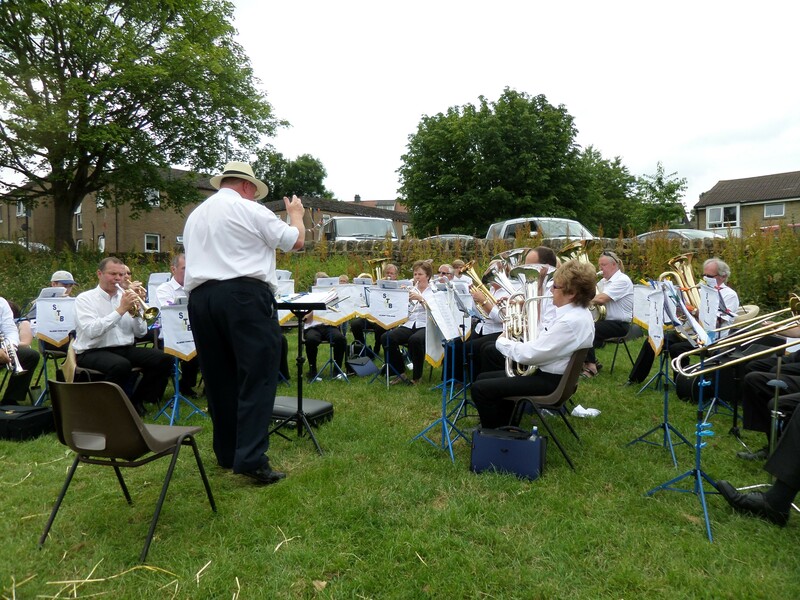 The band played at Addingham Gala on what was a beautiful summers day. There were quite a number of people listening and the band provided a varied programme of music. The Solo Trombone part was provided by a guest player from Skipton Band. The programme got off to a rousing start with the march – ‘The RAF March’, followed by a beautiful rendering of the tune from the Cats musical – ‘Memories’ featuring principal cornetist Rob Bergman. Other pieces played were ‘Oliver, Londonderry Air, Mellow Mood and I Feel Good’ before the band had a break. During the second part of the concert the band played ‘Florentiner March, Swinging Safari, Lion King, Crazy Little Thing Called Love, Baggy Trousers, Singing in the Rain and Floral Dance’. It’s not often we have a social function at Silsden Town Band, but on 19th July 2014, we put that to rights. 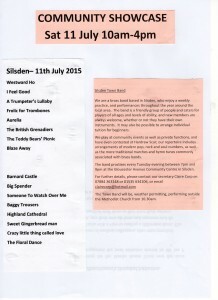 An annual event in the Silsden calendar is Proms on the Farm. A local farmer and his wife make two fields available for the event and with an army of helpers, they present a wonderful evening of music for the benefit of local charities. The event is made up of a Big Band, a Pop Group (or Folk Singers) and a Championship Section Brass Band, culminating in a “Last Night of the Proms” feature, and, of course, “Jerusalem”, “Land of Hope and Glory” and the appropriate female singer. Two band members, Mary (First Horn) and Michael Binns (Librarian) have gone to this event for years and thought it might be a good idea to make it a bit of a Band “do”. It was put to the band at rehearsal, the concept being, a picnic, followed by a bit of a “boozy” evening and it met with some approval. Cometh the night, ten players, plus M.D., spouses and friends converged on Sycamore Farm, Brunthwaite. 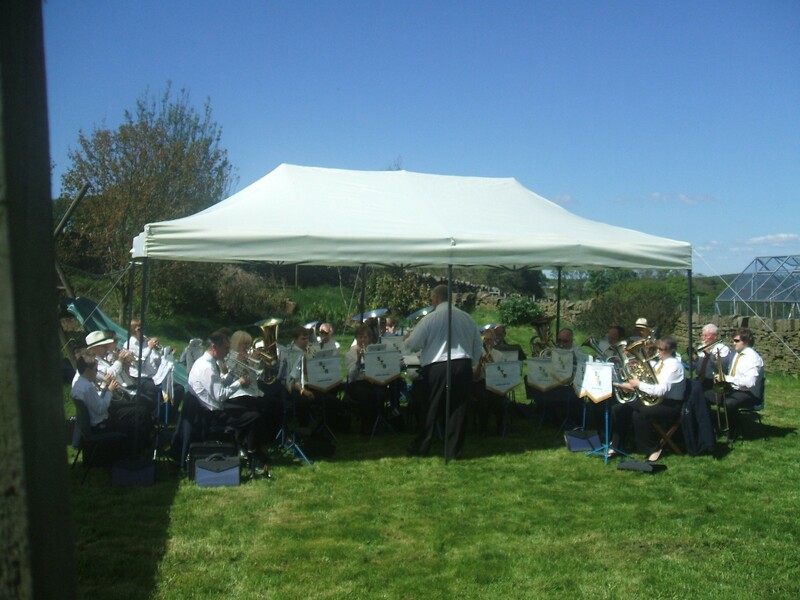 A working party had met in the afternoon and erected the band’s somewhat substantial gazebo. This was done in steady rain, well, for us, steady, for those in the south of England, torrential. Completion of the task was celebrated with the opening of a variety of bottles, ranging from cider to Pimm’s. Now undercover, the site was bathed in glorious sunshine, but the scene was set. As the evening progressed and people started to arrive, the gazebo started to look smaller. The rain, having stopped earlier, decided to have a real go at us this time and it threw it down, even by Yorkshire standards, however it did clear, never to return and left us with a beautiful evening. The bands were good. Is it our imagination, was the pop group too loud? The picnics were super, ranging from a sandwich, to nearly a meal. The wine flowed and a good time was had by all. At the end, not much before midnight, the flags varied from The Cross of Saint George to the Southourn Cross for New Zealand as Patriotic Songs rang down the Aire Valley. Most said, it was a good evening and we should do it again. I think we should. (£11,000 was raised for charity). 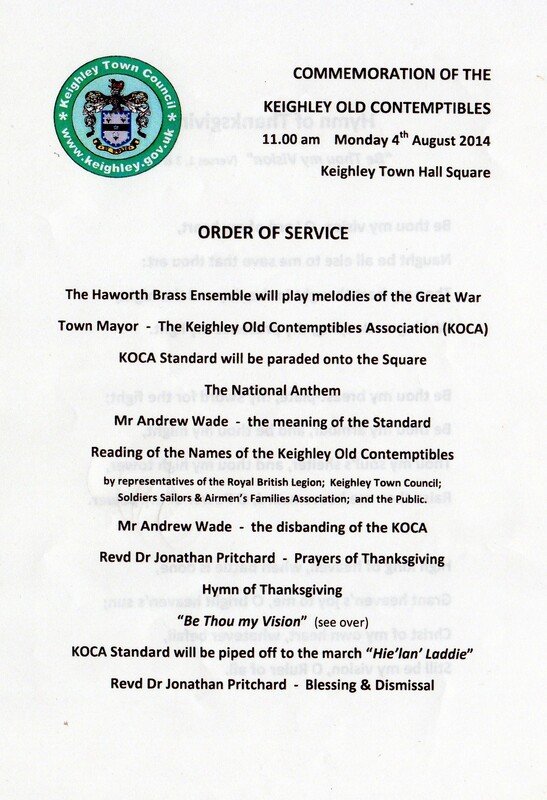 Commemoration of the Keighley Old Contemptibles 4th August 2014. 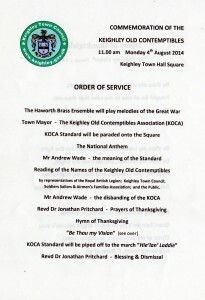 Corrie and John Sunderland, Phil Corp and Mavis Clarkson supported the Haworth Brass Ensemble at the Commemoration Service of the Keighley Old Contemptibles in the Town Hall Square, Keighley. The event marked the outbreak of the First World War one hundred years ago on 4th August 1914. 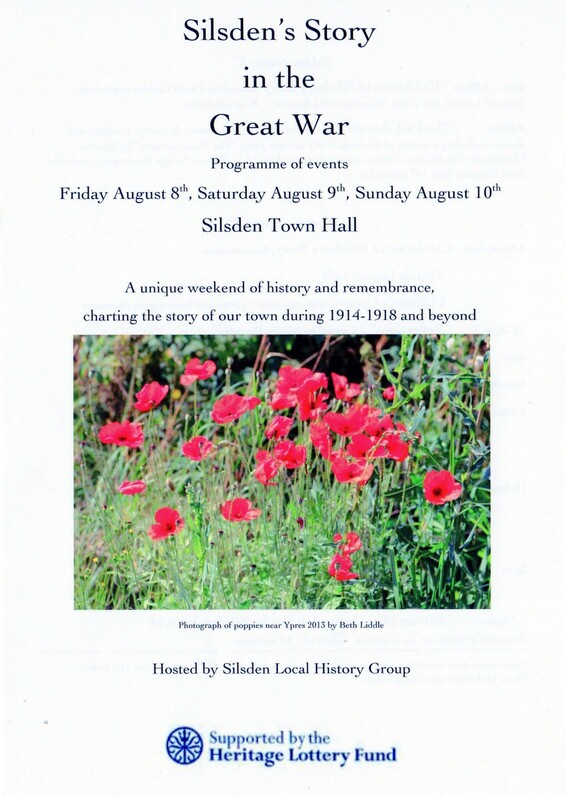 Silsden Brass Band took part in Silsden’s Story in the Great War at Sislden Town Hall where an exhibition was hosted by the Silsden Local history Society. 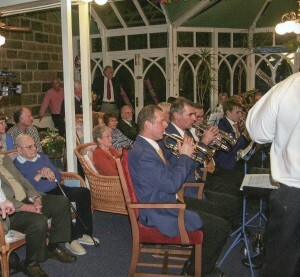 The band performed a short programme lasting an hour to a decent appreciative audience. The Great War exhibition in the hall reminded us of the many Silsden organisations that suffered losses in that terrible conflict. 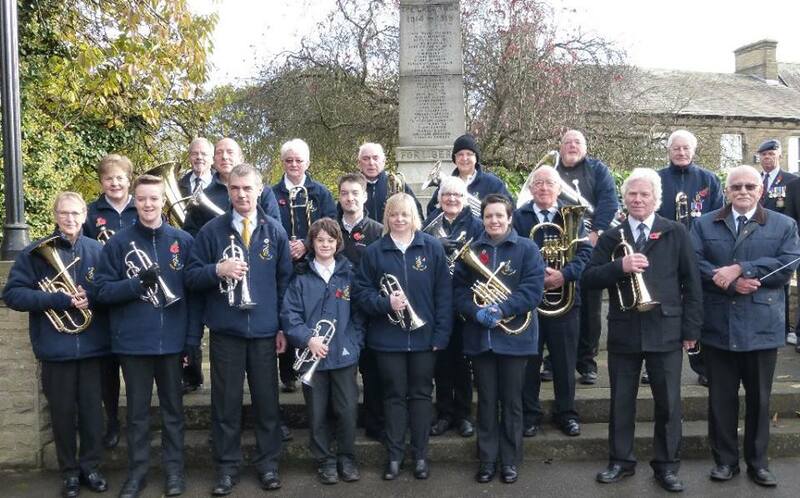 Silsden Brass Band lost two members of the band in the war, these were Corporal Fred Taylor – trombone player who died in 1916 and Private Bernard Locker who was a bugler in the forces and was missing presumed dead in 1916. Community Show Case 11th October 2014. After the wonderful community spirit that the Tour de France had generated earlier in the summer the first community show case was organised at St James’s Church to show and highlight what local voluntary groups were doing in the town. 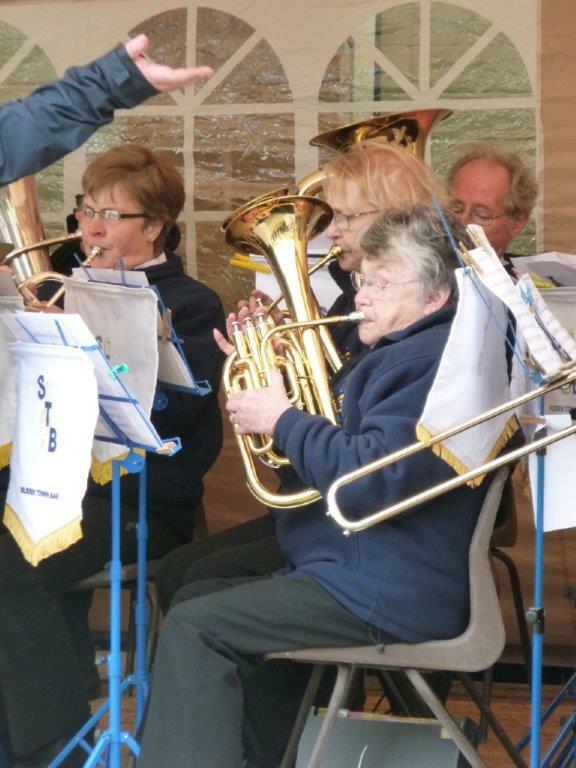 The Silsden Town Band was among the thirty voluntary groups that took part and some members of the band took the opportunity to promoted the activities of the band, including publicising the autumn concert that was to be performed at the Silsden Methodist Church on the same weekend. The band joined forces with the Oxnop singers to perform two concerts, one at Silsden on the Saturday evening and the other on Sunday evening at Oxenhope. The band changed their uniform slightly and introduced black shirts wearing black shirts with gold waistcoats at Silsden and black shirts with blue waistcoats at Oxenhope. Band Donates Instruments 16th November 2014. 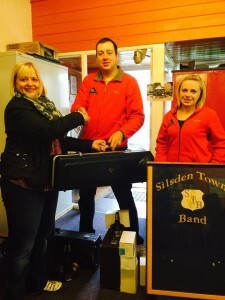 Silsden Town Band have donated 1 cornet, 1 bass, 2 troms and a baritone and some mutes. The academy were extremely grateful for the donation. The person in charge conducts a band at Elland, and they have offered their services if we ever need help. Congratulations also to Margaret Anthony (2nd Baritone) on passing her Grade 3 Practical. Wedding at Burley 2nd May 2015. Although the weather forecast for the day was not very good, the band assembled on The Green at Burley in Wharfedale to play for the wedding festivities. We were able to play quite a few pieces before the rain started (just as the bride and groom were due to arrive on The Green), and we had to pack away our things and change the venue and move inside. We were told to play on the balcony and all sorted ourselves out ready to play, when someone told us that there were too many people, and it was a fire hazard so several members had to drop out and listen. 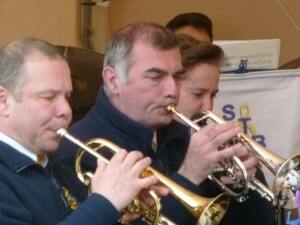 The rest of the band continued with the planned programme. All in all it was not a very good ‘gig’ and everyone was happy to pack up and go home. Ilkley Band Stand 31st May 2015. The band’s sponsors – Cooperative Funeral Care, asked the band to do a programme on the band stand at Ilkley. 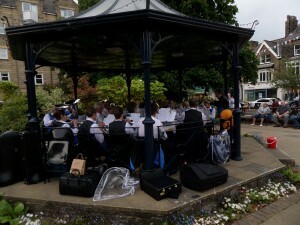 Ilkley Band Stand 13th June 2015. 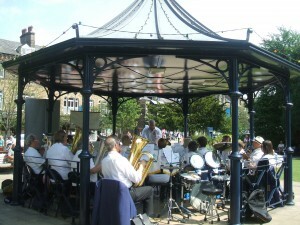 The band played at Ilkley Band Stand to raise money for Martin House Hospice. It was quite a nice day, and there were a lot of people around listening. 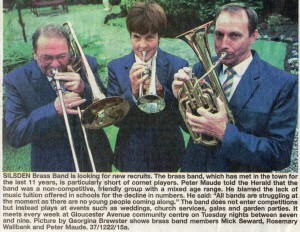 Sylvia Somers was in charge of the band as Andrew Dunne the MD was on holiday. The band played a varied programme throughout the afternoon, playing three separate spots. The programme included well known music including Penny Lane, Mr Blue Sky, All In The April Evening, British Grenadiers and the Skye Boat Song. 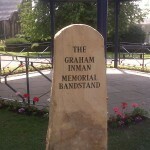 Cranbrook (Ilkley Moor Bah’t’at) was also played in honour of the town in which the band were playing. The programme seemed to be well accepted by a fair sized audience. Silsden Park 4th July 2015. 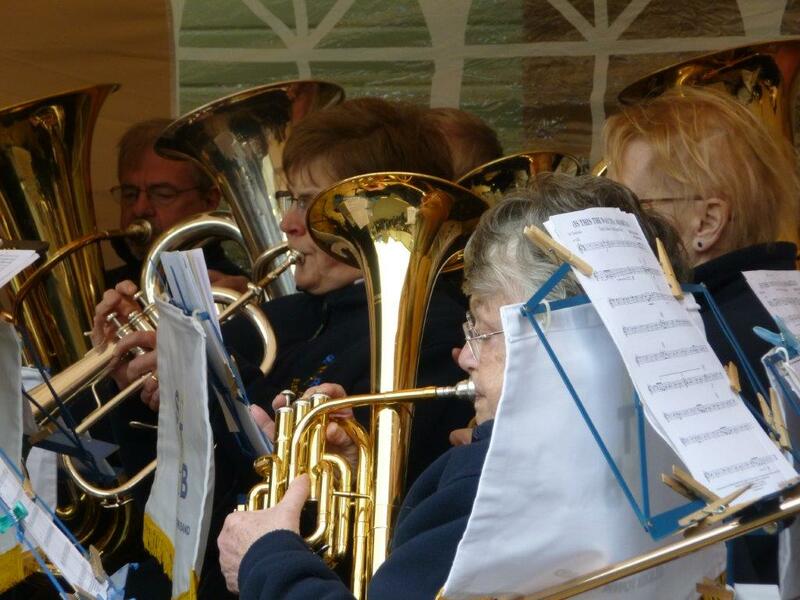 Unfortunately the weather was so bad that the Silsden Churches Together Service had to be held in Silsden Methodist Church instead of around the bandstand, this meant that the band did not actually play for the Switching on of the Christmas Lights. The band played outside Booths Supermarket in Ilkley in the morning and raised the sum of £560 for the Martin House Hospice. 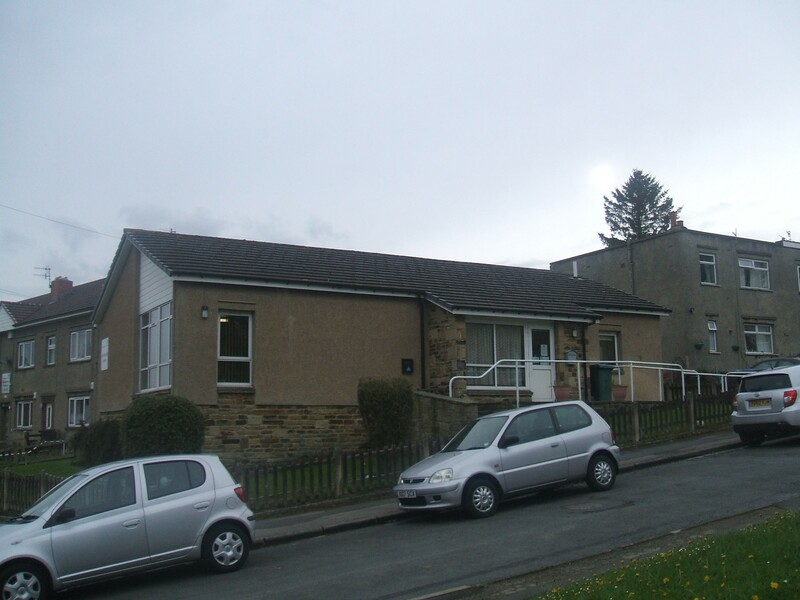 In the afternoon the venue for playing was Steeton Court Nursing Home, where carols were played for the staff, residents and their families. 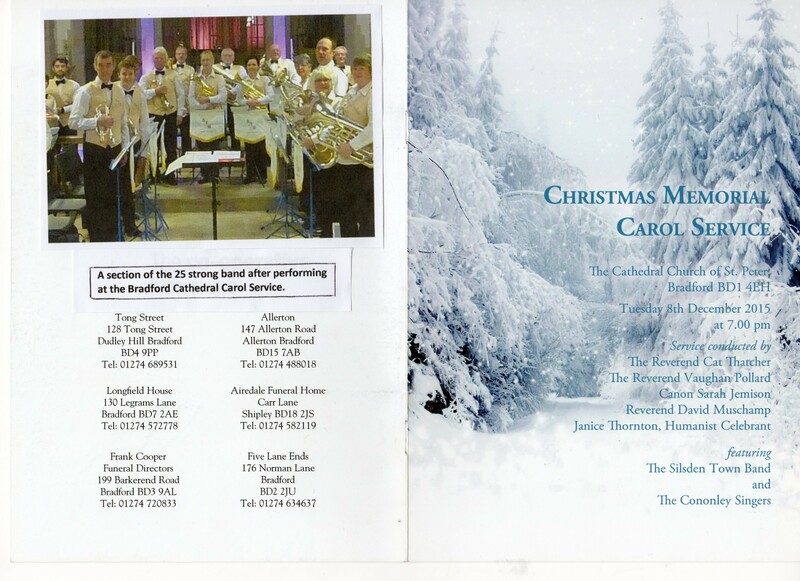 December 7th 2015– Carol Concert at Cross Hills Conservative Club. 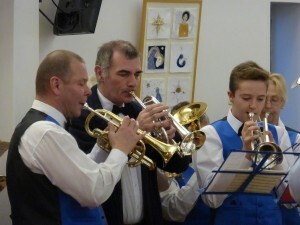 The band played Christmas Music for the customers and enjoyed a pie and pea supper provided by the club. 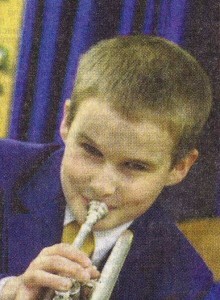 Robin had been in the band from being a young child. He played in the cornet section and prior to leaving the band had moved on to Solo cornet alongside Principal Cornet Player Rob Bergman. 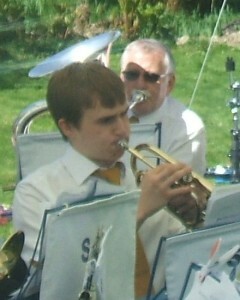 Robin has left the band as he has moved away to study at Coventry University. STB join in Church’s centenary celebrations. The last time the band played at Oakworth station, the rain was torrential and rain stopped play so to speak! Thankfully, Sunday 27th February was completely the opposite; it was chilly but the sun shone brightly in a clear, blue sky. 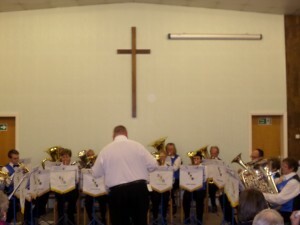 The band had been asked to play a selection of hymns and marches by Worth Valley Community Church, which was celebrating the centenary of its denomination (The Apostolic Church). A Centenary Baton was making its way around the country and WVCC wanted to celebrate by having the band play as the train steamed into Oakworth station carrying members of the congregation and the baton. The baton was welcomed by other members of the congregation waiting at the station to the resounding triumphant hymn ‘To God be the glory’. The afternoon was enjoyed by passengers waiting to embark as well as local people who came out of their houses to listen – the train passengers were also delighted to have the accompaniment of a band as they rolled into the station. The Apostolic Church in Keighley actually opened its first church in Silsden before moving into the Worth Valley area of Keighley. Two members of the band are also members of WVCC providing a nice link between the band and the church. 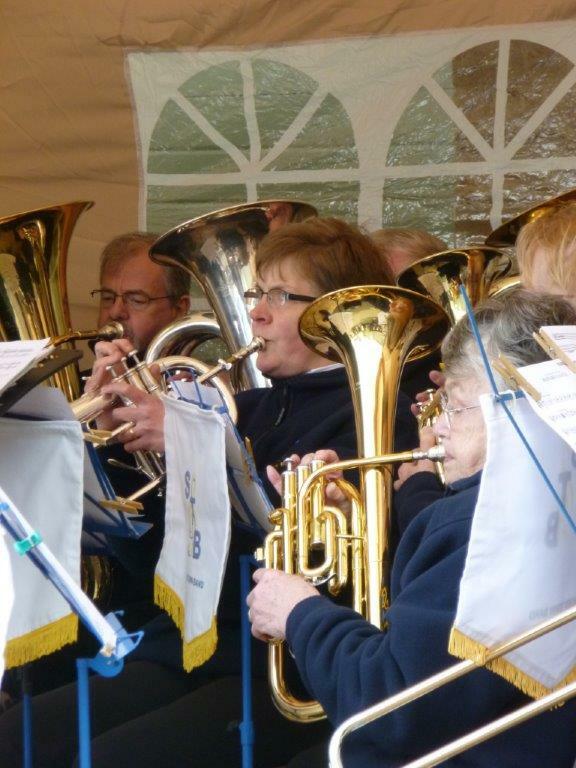 It was a cold day on April 23rd 2016 but fortunately it was dry when Silsden Town Band played at Naylor’s Brewery in Crosshills for their St George’s Day Celebrations. The band played a wide variety of music including Munchen steht ein Hofbrauhaus and Beer Barrel Polka to suit the venue . Andrew ably compared the various things that the brewery had organised including the Yorkshire Pudding Eating competition. During the interval a few members of the band sampled the beer, which seemed to go down well. For Martin House Children’s Hospice. See below for comment from Martin house. We are pleased to report that we raised £187 on Saturday. It was a lovely afternoon and we really enjoyed the Band’s performance. Please thank them on our behalf. Martyn took a photo which I will send in to the ilkley Gazette with a short press release in the hope that they will do something with it! 18th June. The band played again on a fine but chilly afternoon to raise money for Ilkley and District Good Neighbours. This association was set up in the 1970’s and comprises of a team of local volunteers who help the community by offering assistance to people in need, whatever their problems might be. 9th July. The band played in Silsden Park for the celebrations at the commencement of Silsden De Party, the villages festivities commenced a couple of years ago for the Tour De France. It had been a very wet week, but the rain stopped and although the grass was very wet, the weather was dry. A varied programme was given by the band under the leadership of Phil Corp, and a few people braved the weather to sit and listen. 16th July. 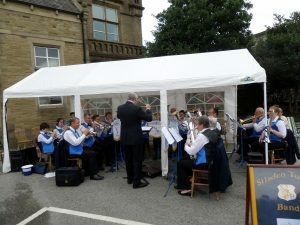 This time the band played in the grounds of Silsden Methodist Church on a pleasant Saturday morning. Sylvia Somers took the baton on this occasion. 31st July. 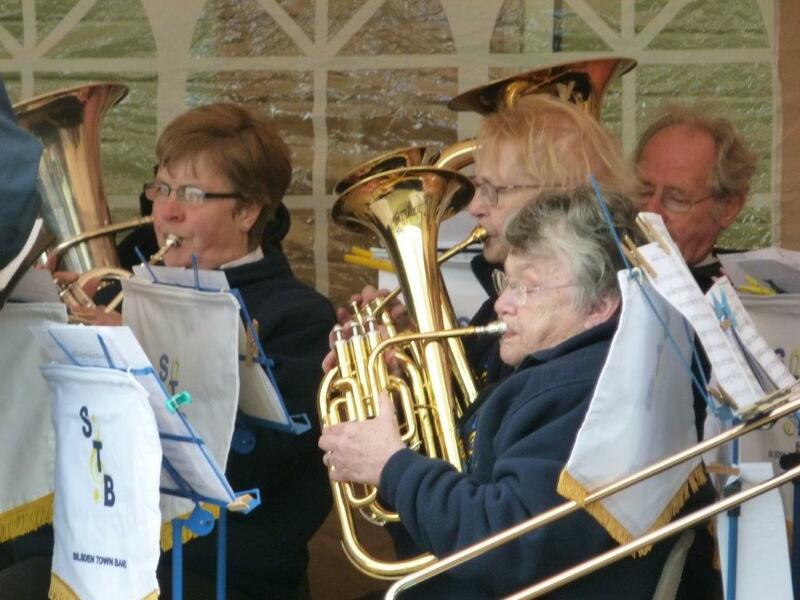 In the bandstand again to play before the procession for Silsden Gala. ridge, who was formerly the MD of Ripon Band until 2015. Malcolm made a round trip of over two hours from his home to kindly help out on the day, which was greatly appreciated by the band. Clear skies, a fading sun, a still canal reflecting the buildings all created a beautiful setting for the arrival of the Kennet and Silsden Town Band’s contribution to the celebrations. People gathered both sides of the canal to greet the boat and the bells rang out from the parish church. Armed with fortyfive minutes of music under the supervision of Sylvia, the band was ready. Beginning playing at 6pm, the programme was light and fun as befitted the occasion. The Kennet was due to arrive at 6.15. Around 6.30 a call came from the Kennet – the bridge wouldn’t open at Riddlesden – there would be a delay! The band played on! An hour later with the sun having already set, another call – the Kennet is having to go slowly because of the darkness and safety! And still the band played on! Baggy Trousers and Crazy Little Thing Called Love ­(for the second time) proved particularly popular with the local vicar. At 7.55pm, almost two hours later, the boat arrived amidst cheers and claps and the sound of The Floral Dance (also for the second time). Despite the lateness, a great time was had by all and the band, once again, showed resilience and commitment to the occasion. 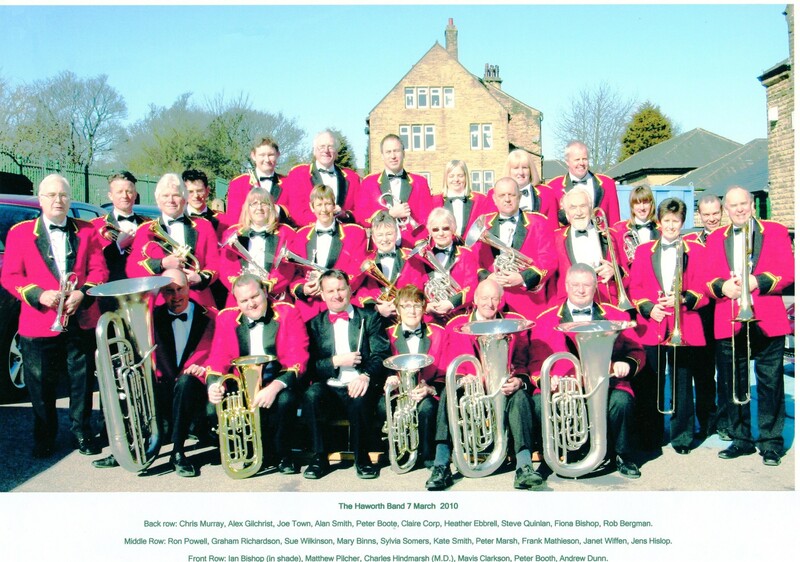 SILSDEN Town Band have launched an urgent appeal for help as they face potentially their last-ever concert. Officials warn that the long-established band’s next concert on December 18 will be the last unless a new leader can be found. The band also desperately needs new players. 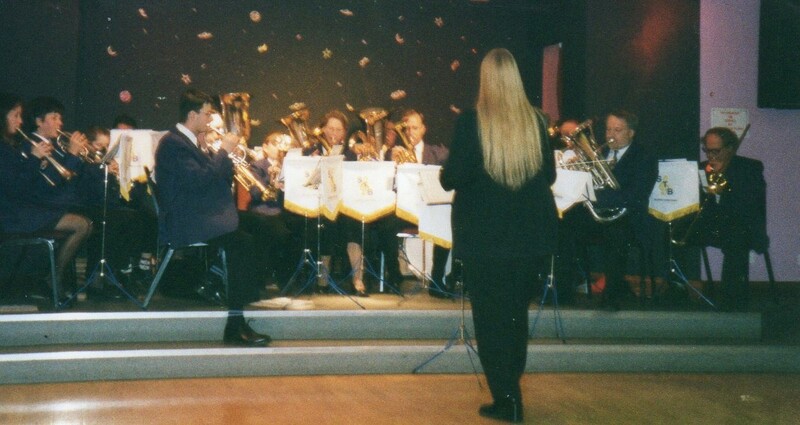 The band’s origins date back to the 1840s, and following its disbandment during the Second World War it was revived with great success in the 1990s. Band spokesman Claire Corp said: “Since then it has gradually grown in strength. It is a friendly band, whose members aim to enjoy and entertain with their music. Claire said the band’s fortunes had again turned, with a desperate need for both players and more importantly a conductor or musical director. Claire said the origins of Silsden Brass Band went back to the 1840s when it is thought the group changed from a Pipe and Reed Band into a Brass Band. She added: “At the outbreak of the Crimean War with Russia in 1854 nine members of the band joined the Royal Lancashire Militia and were sent to the Crimea. “On their return home from the war to civilian life the Silsden Brass Bandsmen were allowed to wear the distinctive white military uniforms of the Royal Lancashire Militia, a privilege awarded to them for their services in the Militia Band. Claire said the band’s early years were probably one of its most successful periods. 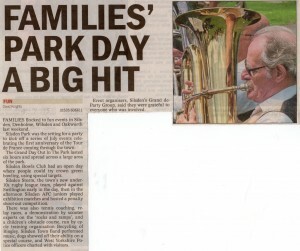 She said: “The band entered the British Brass Band Open Championships at Belle Vue in Manchester in 1863, where Silsden came third after Black Dyke Band and Bacup Band. 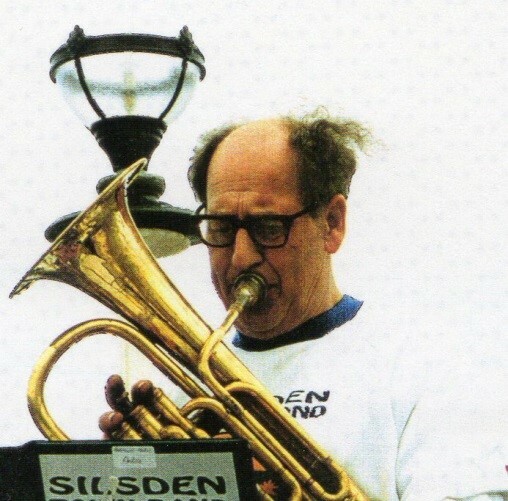 “One of the most notable Silsden bandsmen at that time was Edward Newton who became very well known in the brass band world as a prolific composer and arranger of brass band music. 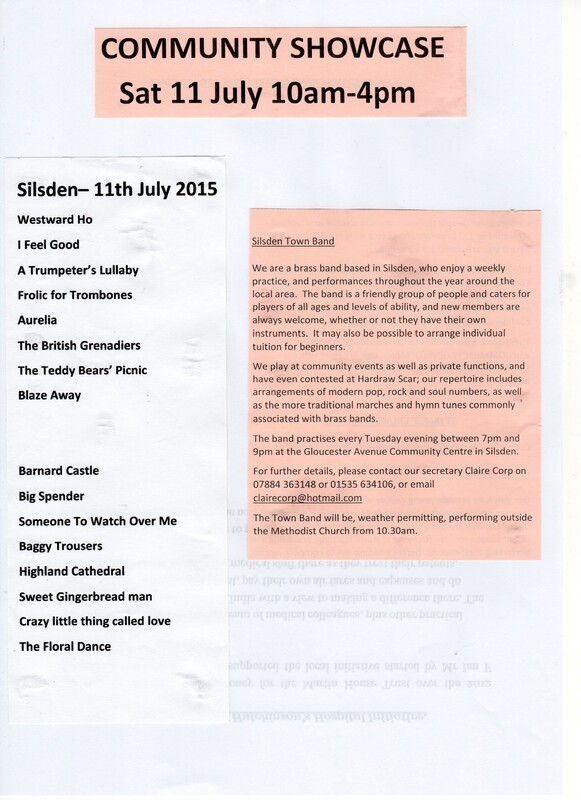 Silsden Town Band practices on Tuesday evenings in the Community Centre on Gloucester Avenue, Silsden. Anyone interested should contact Claire on 07884 363148. Four people showed interest and the band have moved forward see headlines.